We believe that the Avatel employees or as we like to say, our Avatel family members are our biggest asset, contributing to the success, innovation and advancement of our company. 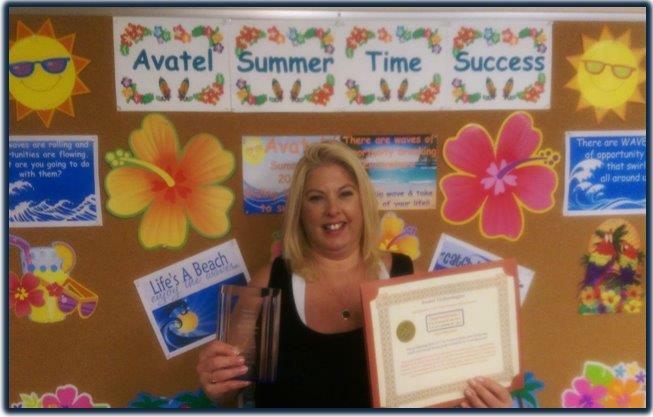 Our spotlight page is an effort to recognize our employees that make a big difference and demonstrate behaviors that exemplify Avatel's values. Avatel is dedicated to provide meaningful recognition for the accomplishments of our employees. 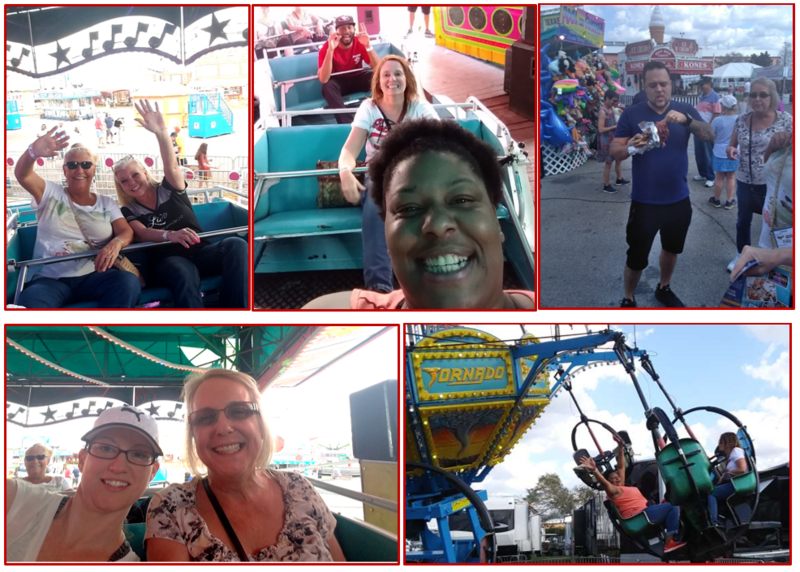 Check out the articles below and see for yourself the kinds of wonderful things our employees are doing behind the scenes at Avatel. We believe that life is too short to not have fun, and "Fun" is an important part of the Avatel culture. We are very excited to start a New Year, but before we can focus on 2019, we must look back. The symbolism of the New Year provides the opportunity to review our previous year and focus on our priorities ahead. Avatel is an exceptional company with an extraordinary heritage and a promising future. As we review our results form 2018, we take great pride in our team’s performance. 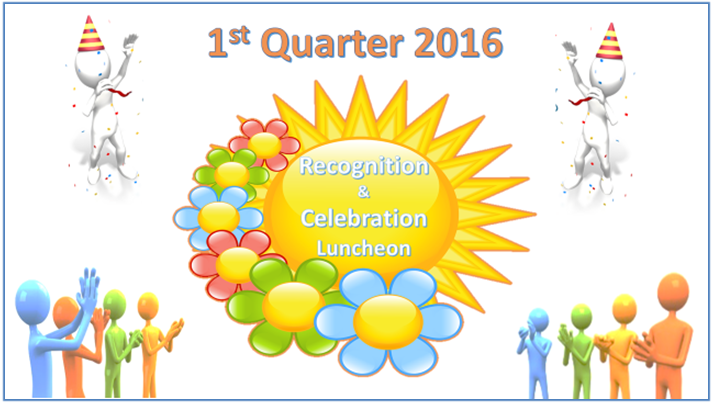 Our recognition luncheon is about coming together and recounting individual and collective achievements. So, before we can begin 2019, we need to take the time to acknowledge our achievements and celebrate our successes. Congratulations to our 2018 Top Sales Associates! There are stars among us, and our recognition not only helps them to shine brighter, but helps us to see our own possibilities more clearly. 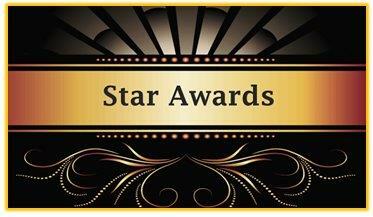 We recognize our Avatel Stars as they deserve the chance to sparkle! Our Avatel Stars are reliable, dependable, proactive, and self-motivated . They all have the drive and the will to succeed. And, they each go above and beyond what their job requires. The mere thought of holiday traditions brings smiles to most people’s faces and elicits feelings of sweet anticipation and nostalgia. At Avatel, we love this time of the year. The most important function of our holiday rituals is their role in maintaining and strengthening our family ties. 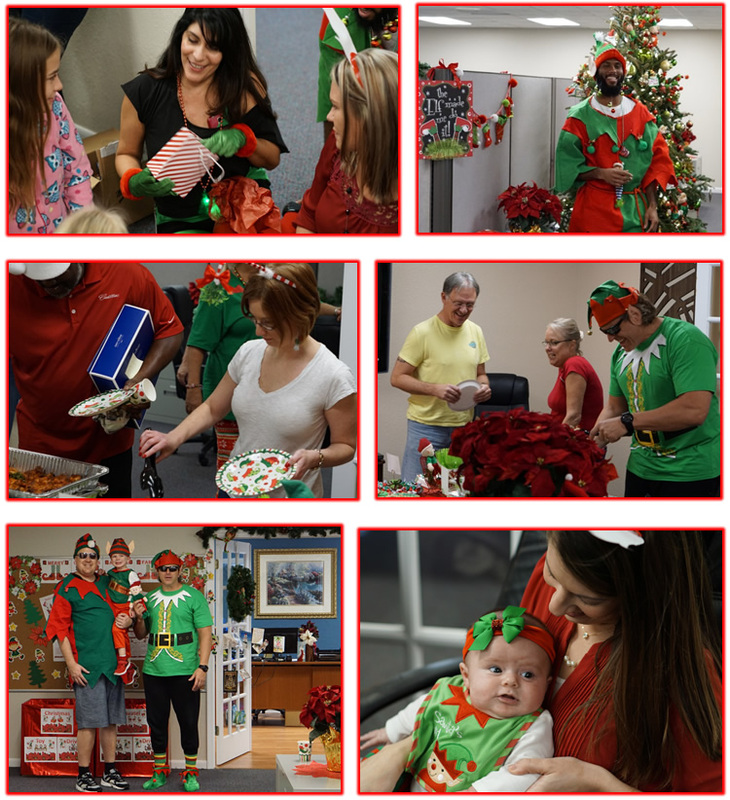 Our holiday tradition would not be complete without our Avatel Elf Christmas Gift Exchange Game, and our Ultimate Christmas outfit contest. As a huge part of our holiday tradition, we go all out with our Christmas decorations. We love to bring a bit of yuletide sparkle into the Avatel office. I believe that a festive environment brings out that childhood anticipation and excitement we remember. No matter what our Holiday traditions are, what’s most important is spending time together at Christmas and creating a culture where everyone can enjoy being a part of one big family. At Avatel, we understand that the holidays are a challenging time for families in need, and purchasing gifts can be out of the question. For many, Metropolitan Ministries was their only source of gifts for the holidays. We clearly understood that there would be no toys this holiday season for some of these children unless we chose to help. “Action speaks louder than words”. Most of us have an innate desire to do something good and leave a positive impact on our community. Our annual Toy Drive gave us all the opportunity to turn our charitable thoughts and words into action and bring about positive changes all around us. All of us have our own blessings that make our life beautiful, and it is important to share these blessings with the world around us. We are fortunate to be able to not just live our life, but also to contribute towards enriching the lives of others. 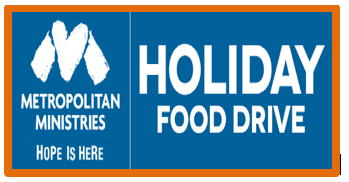 Every year we team up with Metropolitan Ministries to provide holiday meals for struggling individuals and families in our community. Giving brings virtues such as understanding, respect, compassion, and humility. The opportunity to give to others and make a real and positive difference is the great promise of life itself. And when we are grateful, we experience greater levels of optimism, positive mood and feelings of belongingness. What could possibly bring more meaning and fulfillment to life than making a difference in the lives of others? When we sincerely give of ourselves, with no agenda other than to celebrate the pure spirit of giving, we truly experience life in all its richness. We believe that nobody in America should go hungry, especially at Thanksgiving. Our food drive was a great way to provide a sense of hope for the day and warmth in their tummies and hearts. Avatel donated almost 600 lbs. of turkeys. In total, Avatel donated 1,036 lbs. of food. A new record for Avatel!! Just about every culture and tradition has some sort of Thanksgiving and or Harvest celebration. Many cultures traditionally have marked a plentiful harvest with a celebration of thanks. The basic components of the holiday has always been celebrating food and the fall harvest and giving thanks with family and has remained over time. 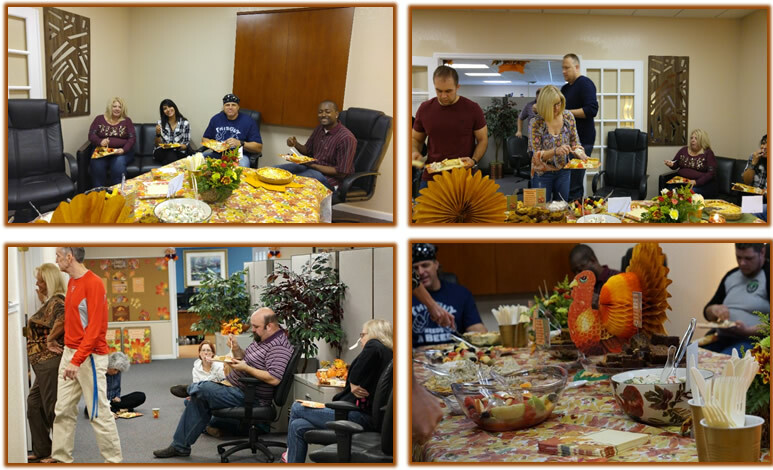 Our Avatel Family Harvest Brunch is a tradition of celebrating with good food and enjoying the time with our co-workers. Thanksgiving time is a time of togetherness and appreciation. It is a time dedicated for expressing our gratitude for the bounty we are blessed with and be grateful for all good deeds. This time will be gone soon, but the spirit of Thanksgiving can be restored whole year around! Even though we only celebrate the harvest season once a year, we experience the spirit of harvest all the time. Each time we receive love from our family and our co-workers, we experience harvest. Any time we are filled, we experience harvest. Traditions are just as important in companies, as they are in families. 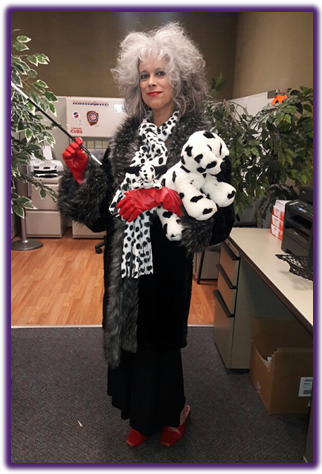 And, Halloween is one of our annual holiday traditions at Avatel. 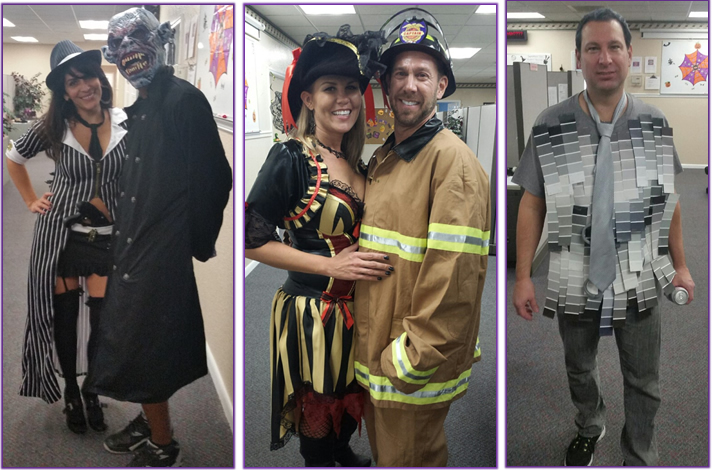 Every October, workplaces like Avatel welcome witches, ghosts, zombies and vampires to roam the halls. 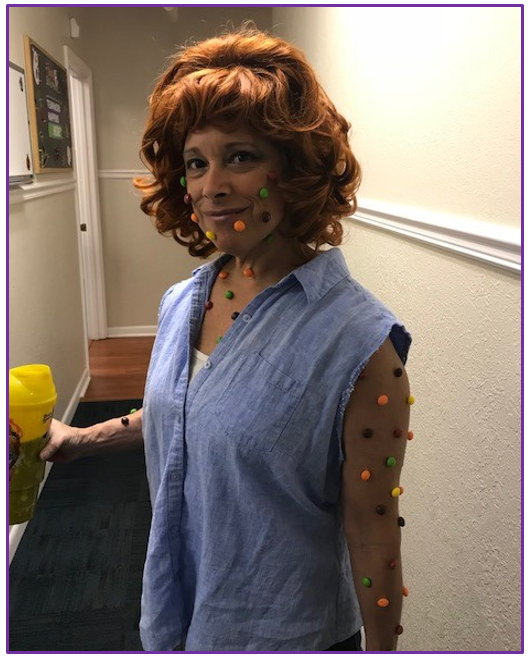 Halloween is an occasion that inspires creativity, as no Halloween celebration is complete without the opportunity for staff members to wear costumes. It can encourage bonding in the office, as coworkers can come together to admire one another’s transformations. Nothing says Halloween like a good old fashion costume contest! 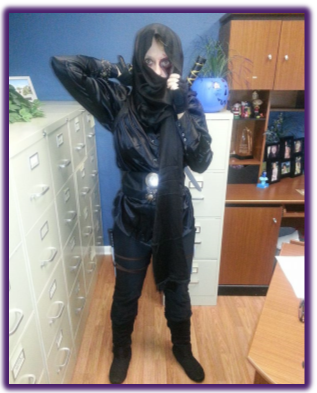 We have a costume contest each year at Avatel and there are always lots of creative costumes. 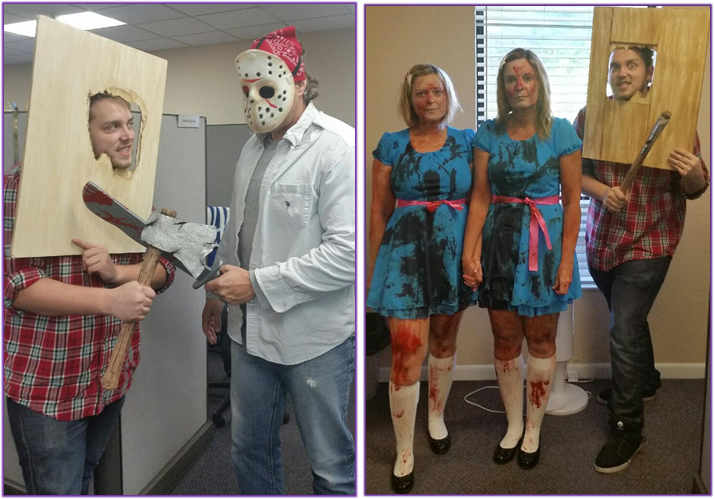 The costumes at Avatel caused laughter, provoked discussion, triggered awe, and scarred us a little. Just as every year, they will be remembered for years to come. The first full week of October is when we recognize Avatel’s Service Department during Customer Service Week 2018. Customer Service Week is a nationally recognized event, celebrated annually during the first full week in October to honor the people who serve and support customers with the highest degree of care and professionalism. Avatel is proud to celebrate Customer Service Week 2018, October 1st – October 5th. This is our 8th year participating with other service professionals world-wide. We join them in celebrating our Service team members. 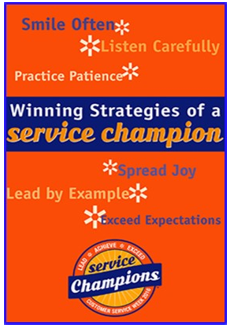 This year’s Customer Service Week theme is ~ Excellence Happens Here. The theme recognizes that space where customers and service professionals come together. From the call center to the executive suite, from the loading dock to the home office, from behind the wheel to in front of a monitor. Where service happens is where Excellence Happens. Excellence is not attained with a one-time isolated event. A life of excellence is a life in which there is a renewed commitment to excellence every day. Excellence is a product of your attitude, your passion, and commitment. If you throw yourself wholeheartedly into everything you do, with a total commitment to excellence, there are no limits to what you can accomplish. Lasting achievement, whatever the endeavor, comes from a commitment to excellence every step of the way. Excellence is certainly within your reach. All you have to do is make a firm commitment to it, and then stick with that commitment. The effort you put into creating excellence will pay off many times over. 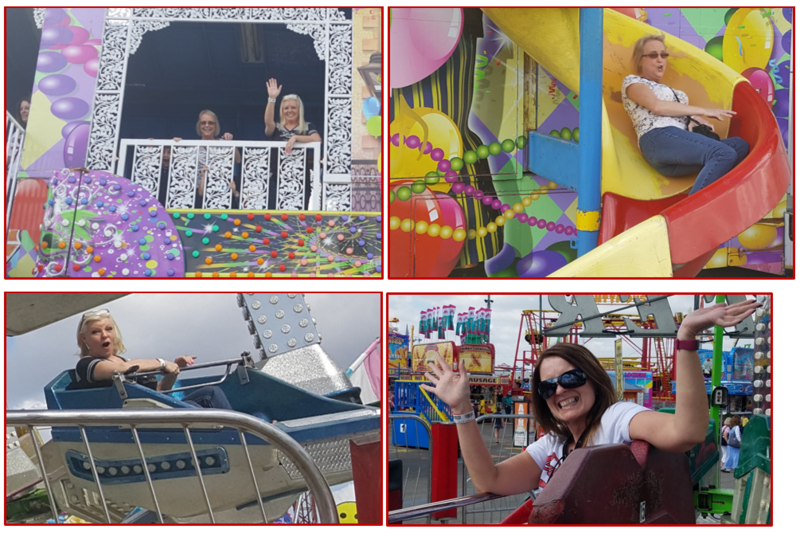 Avatel celebrated an EXCELLENT Customer Service Week in style by incorporating fun activities, tempting treats and special gifts that made it a week to remember. 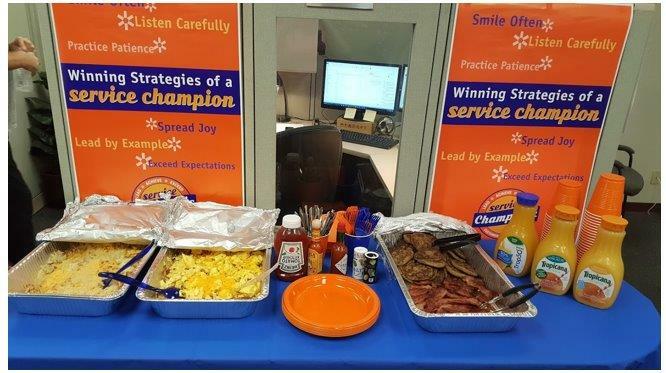 We started our week with team members dressed in comfy pajamas and cozy slippers enjoying a hearty breakfast. Special gifts were handed out to make the week memorable. On Tuesday we followed with a chair massage for each team member to relieve stress and tension – renewing energy levels, and enhancing concentration. 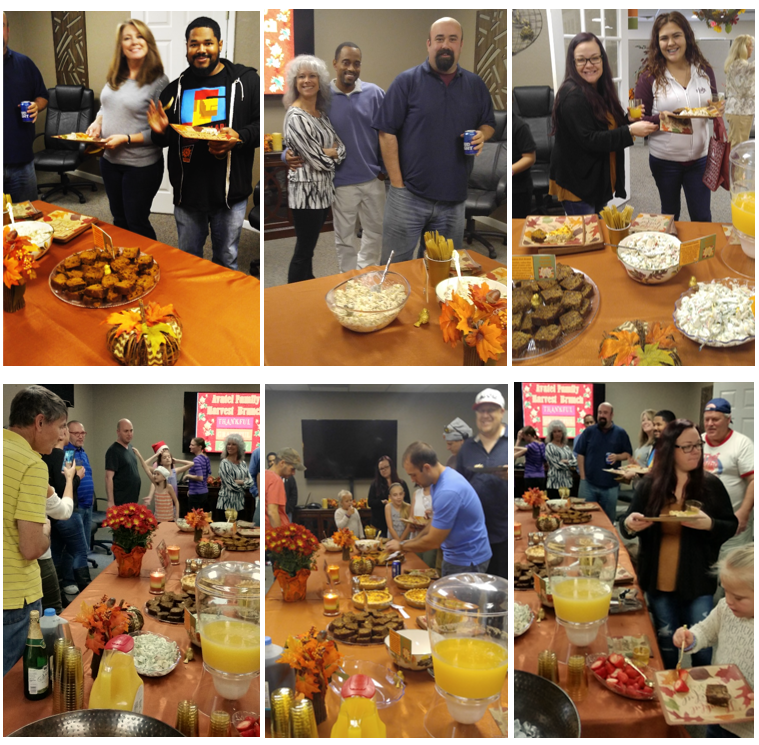 On Wednesday we enjoyed an Appreciation Lunch, along with gifts to celebrate the fact that “Excellence Does Live Here at Avatel”. 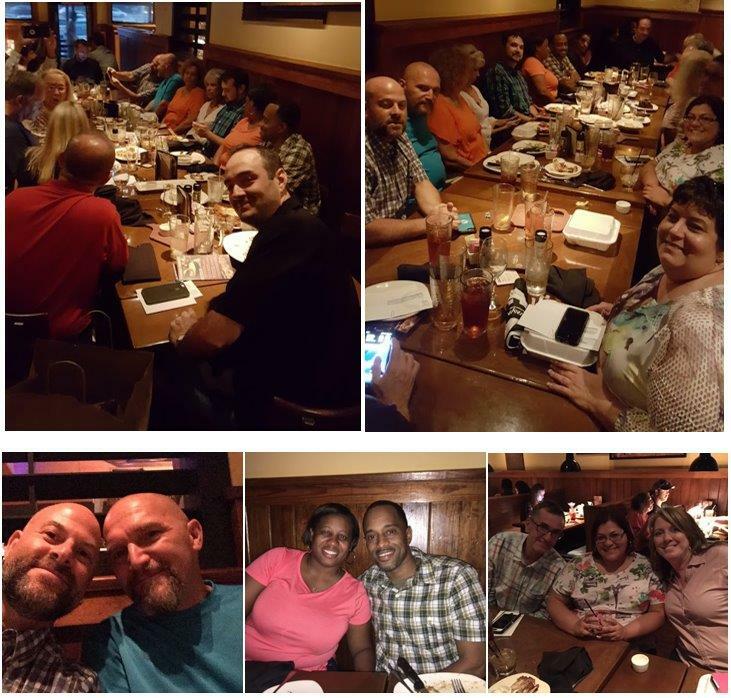 On Thursday, we enjoyed our annual Recognition dinner at the Outback Steakhouse. A special thank you gift was handed out to show Avatel’s appreciation for all of our team members’ hard work and dedication. We finished the week off right with a little team building at the Legends Escape Rooms. 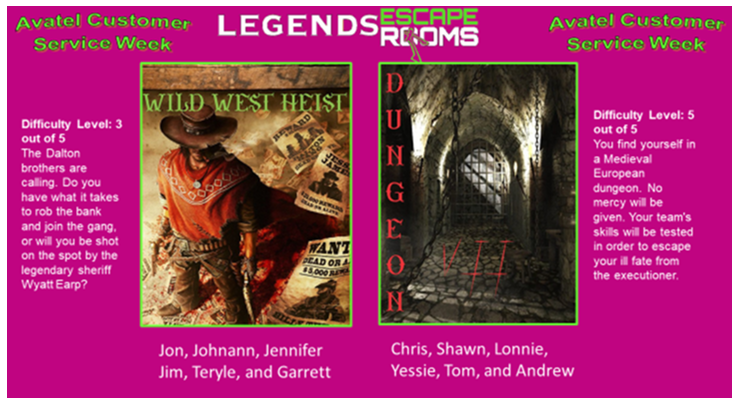 The team members were split up into two groups, one room was the Wild West Heist and the other room was the Dungeon. Only one room escaped- the others perished in the dungeon! 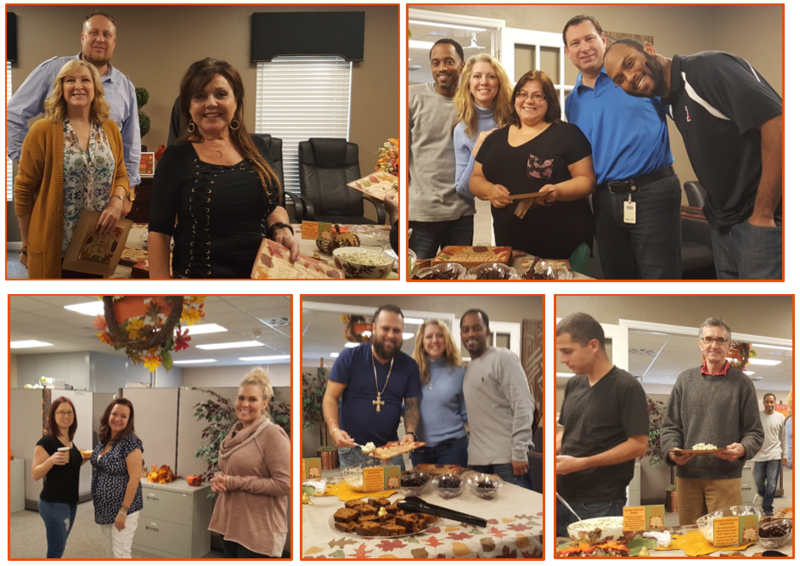 All during the week other departments recognized our service team co-workers for providing excellence for our internal or external customers. 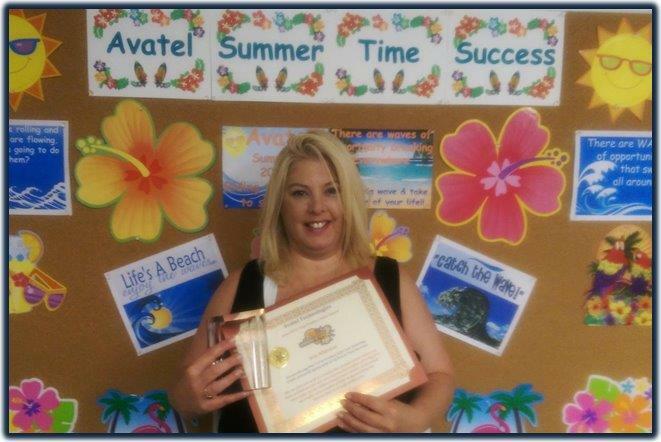 We displayed the “Caught in the act of providing Excellent Service” notes on our “Avatel wall of Fame”. We believe that it is important to recognize our Service Staff and express thanks and appreciation for what they do throughout the year but specifically during the first week of October. No service-oriented organization or company can succeed without a group of people who provide excellent levels of customer care. 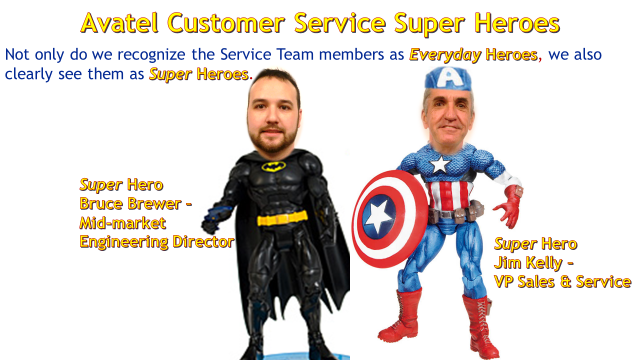 Customer Service Week is our greatest opportunity to show the Avatel Service Department staff that we appreciate their hard work and dedication!!! Our 4 week tournament ran from March 1, 2018 until March 28, 2018. The Seeds (rankings) were determined by February sales. The sales championship was based on 2 brackets (product rev. bracket and system unit bracket). There were weekly winners and the winner’s moved on to the next round, and the losers were eliminated. 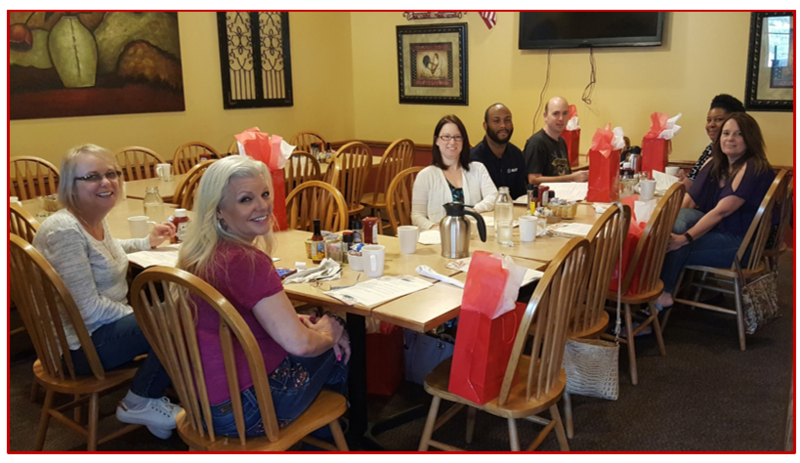 Those that made the Final Four attended the “Final 4” Breakfast with Management and our Sales Assistant during the last week of March. Congratulations to our “Final 4” Winners!! The Olympics show us what is possible for humans to achieve, individually and in teams. To me the Olympics embody the magic of achievement. When you get someone in the right role that aligns with their natural strengths, abilities, and ambitions, the magic happens. They thrive, they are motivated and energized, they grow, and they do amazing things. When you get a whole team of people who are in the right roles, the team becomes unstoppable. This team is our Operations Team. 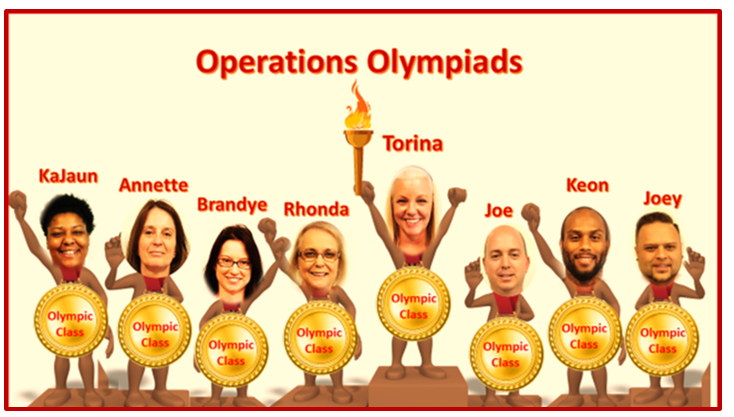 With that said, the Olympics was the perfect time to celebrate our Operations Olympiads and recognize their successes, accomplishments and contributions during the week of February 12th through February 16th. Events like the Olympics remind us that passion and focus are critical to our success! Successful individuals like Avatel’s Operations team members share traits similar to Olympic athletes ― strong will, unwavering confidence and ambitious attitude. Just as the Olympic Athletes, they all strive to bring honor to themselves and be the best they can be. 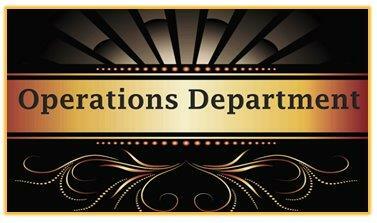 From first impressions to lasting impressions, our Operations Team is the backbone of our organization. A structure is nothing without a solid foundation, and our Operations Team is as solid as you can get. These are the people who make sure internal and client operations run smoothly. Olympic class performance is reached through determination, hard work and through our attitudes and actions needed to create success. You can’t mess with a company that has a strong Operations Team. Our Operations Olympiads know what it takes to perform at a high level to provide Olympic class results. We sincerely appreciate our Operations Olympiads and recognize their efforts and the value they bring to Avatel. Please take the time to recognize Brandye, Annette, KaJuan, Joe, Rhonda, Joey and Keon for their contributions, not only during Operations Team Recognition week in February, but all year long! And of course, make a point to thank their Olympic Class Leader Torina for what she does for Avatel every day! 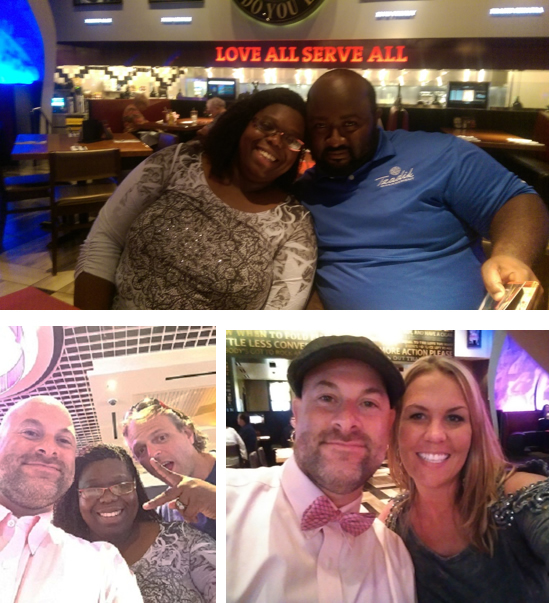 We started the week with breakfast at the Egg & I, chair massages on Tuesday, lunch at the Cheesecake Factory on Wednesday, the Florida State Fair on Thursday and we ended the week with an Appreciation Dinner at Romano’s Macaroni Grill. Enjoy all the pictures from our week of fun and recognition! At Avatel, we believe that every day of the coming year will be filled with opportunity and possibilities. However, before we can move forward, we must review our results from the previous year. In 2017, our theme for the year was “The Spirit of Possibility with No Limits”. We understood that we must be a company that looks beyond the confines of business convention and into a new future; a company who sees opportunity where others see obstacles, by demolishing barriers and revealing the virtually limitless opportunities ahead. We had to believe that there were no constraints and no barriers to our progress except those we ourselves erect. Throughout 2017, we had to continually open ourselves up to the possibilities with no limits on ourselves, and break down the barriers to success. As we busted down the barriers, not only did we retain our prestigious “Partner in Customer Excellence” designation with Avaya in 2017 based on our outstanding customer satisfaction surveys, we also achieved Diamond level partner status, the highest ranking available. Maintaining our Partner in Customer Excellence designation and reaching Diamond level with Avaya speaks to Avatel’s standards of excellence, and is reserved only for partners that have demonstrated exceptional customer service, commitment and results. In our culture, we are always looking ahead at where we want to be and what we want to achieve. However, it is equally important to take the time to celebrate and acknowledge our success. 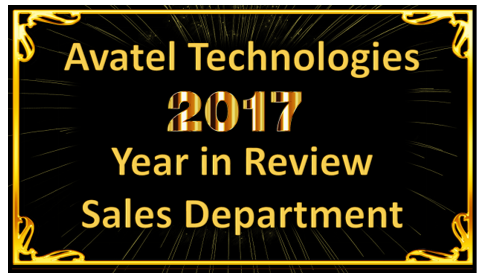 As we look forward to the New Year ahead, it is an important time to reflect upon the contributions, accomplishments, and successes of our Avatel team members. 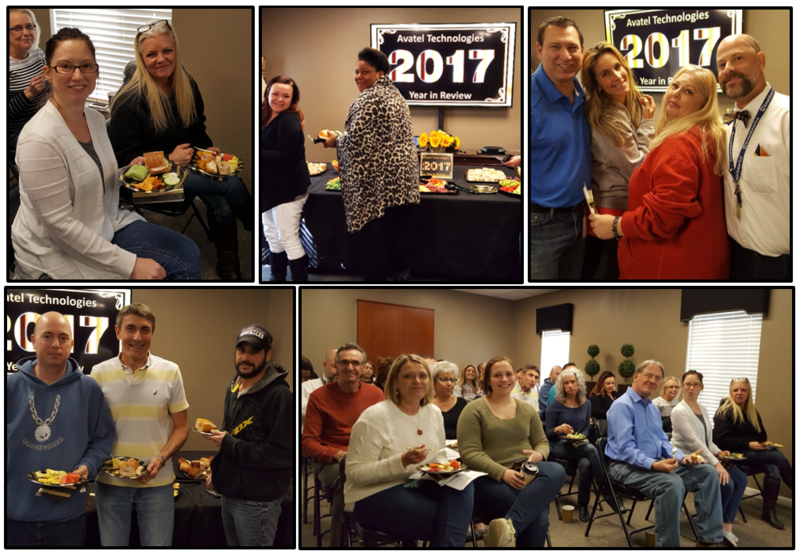 So, before we close the book on another year, we celebrated with each other during our 2017 Year-end Review and Awards Luncheon. 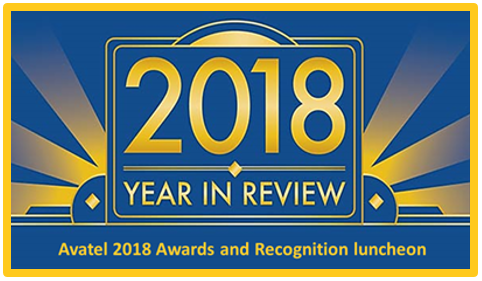 Our year-end review allows the whole Avatel family to come together and recognize everyone’s individual hard work as well as everyone’s collaborative works. We believe that it is really important to take a look back to see how far we’ve come. It not only puts us in a positive mindset as we move forward in the New Year, it creates the positive momentum needed to achieve even higher goals. The Avatel Sales Staff aren’t just the people responsible for building our bottom line, they are also our front-line troops. 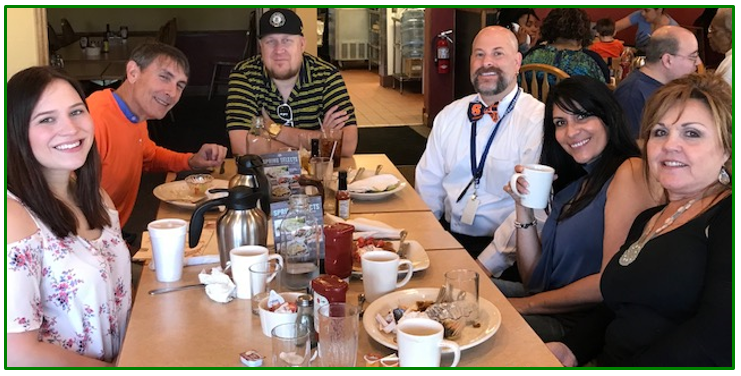 Every Avatel Sales Team member (Bryan Kelley, Dan Meunier, Deb Woodford, Evelyn Guzman, Frank Fautas, Fred Sternberg, Jennifer Tishler, Jorge Rodriguez, Kim Whisman, Laura Martinez, Marc Irvin, Myra Ourso, Rujel Buggs, and Teresa Boully), should be proud of both their individual and collective contributions to Avatel’s sales effort. 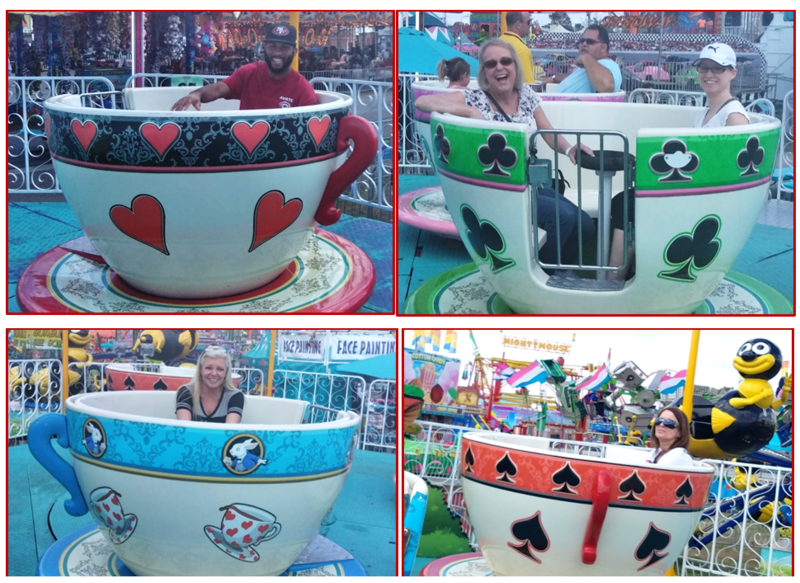 A special thank you to our two Sales Directors – Salena Miller and Andrew Cohen, our Sales Support Assistant – Emily Woodford, and our VP of Sales and Service – Jim Kelly! Join me in congratulating our 2017 Top Performers for their dedication and hard work throughout the year! At Avatel, we strive to sustain a culture of service excellence, from system design and implementation to project management, customer training and ongoing service support. The Avatel Service Dept. 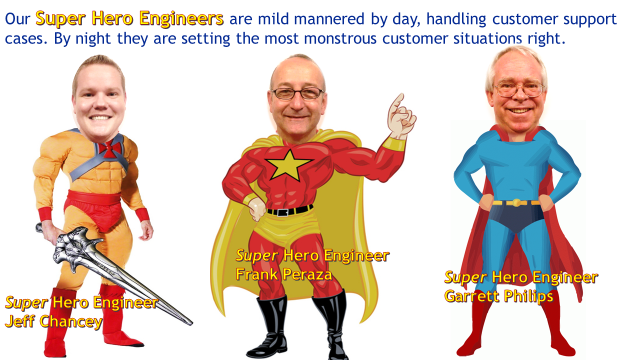 team members (Project Managers and Engineers) demonstrate through their actions that culture of service excellence. Service excellence is an attitude engrained in every Avatel Engineer and Project Manager. Our Avatel Project Managers have the experience, knowledge, and capabilities to help ensure a successful transition of technology for our customers. Whether our PMs are interacting with customers or with co-workers, they consistently go the extra mile to exceed expectations and bring a higher set of quality and customer service standards to our industry. In 2017 our Project Management Team’s activity consisted of: 3,383 solutions managed, 586 internal activity requests, 5,057 service tasks created and 68,500 Service calls handled with a 100.00% service level. The above does not include 124 customer satisfaction survey submissions that enabled Avatel to maintain the highest customer rating available and continue as a “Partner in Customer Excellence”. All of our Project Managers are resilient and are determined to achieve their personal bests. I want to thank our PMs (Johnann Favata, Lonnie Ledford, Jennifer Smalling, Tom Wood, Shawn Roderick, Yessie Valentin, Teryle Dickens, Angela McKnight, and their Leader Rick Heitzmann) for their excellent work throughout 2017. 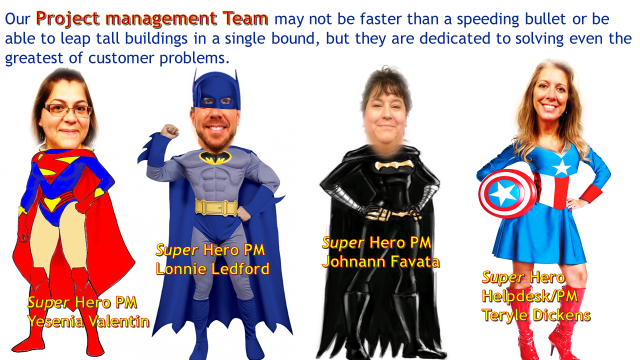 We sincerely appreciate our Project Management team members for the fantastic job they do every day. Our Avatel Engineers exceed all expectations and guarantee Avatel’s continued success. They are the technical experts that deliver our solutions with agility and speed. Our highly experienced technical experts are committed to delivering excellence to our customers and their co-workers. Avatel’s Engineers make communications technology the best it can be. 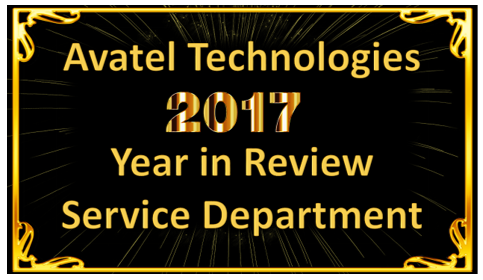 In 2017, our Engineering Team completed – 5,900 Service Tasks, 429 Demo/Customer Presales calls/Tech calls, and 283 New Product Configurations. The above does not reflect the additional work that is performed by our Engineers on a daily basis, such as: systems programmed at Avatel, field installs, Legacy dial-ins, multiple configs for same customer, Avatel lab activity, training on new products, and numerous after-hours work on assorted projects. We sincerely appreciate our Avatel Engineers (Garrett Phillips, Frank Peraza, Chris Perez, Jon Damiani, Ash Chand and their Leader Bruce Brewer) as they consistently demonstrate performance at a level far above and beyond normal expectations. The Avatel Operations department is the department that handles all the day to day operations of the business. They are responsible for driving operational excellence across the organization as they focus on People, Processes and Profitability. They consist of team members that support all of our business functions: Human Resources, Finance, Purchasing and Procurement, IT, and Process development and reporting. They work together to create the backbone of all our business processes. Operations Department Activity for 2017 – The Finance Group processed 17,497 financial transactions in 2017. That include all transactional accounting for the business through accounts receivable and accounts payable . HR handled over 1,279 employee support transactions in 2017, selected a new Insurance Provider, and set-up and managed our open enrollment. IT cared for Avatel’s workstations, operating systems, anti-virus programs, email, and programmed 92 CRM updates. IT also implemented Avatel’s new web-site platform in 2017. Our Purchasing and Procurement team placed 5,998 total orders in 2017. And, in addition to purchasing responsibilities, they also handled all product inventory control, product returns, packing and shipping. Also, a major 2017 Operations activity was reviewing current processes in all departments and updating those processes. Our empowered operations team has a significant reach throughout the organization. Understanding and effectively managing the operations side of Avatel is key to our success. 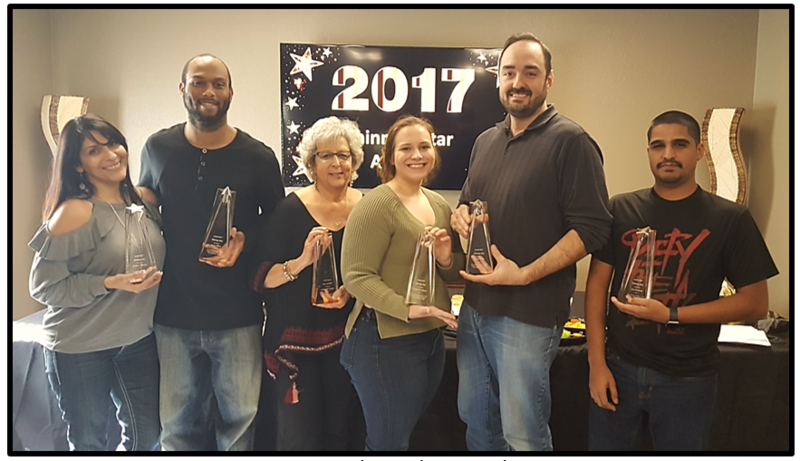 We appreciate our Operations group (Brandye Byers, Annette Duarte, KaJuan McCray, Joe C., Joey Martinez, Keon Hines, Rhonda Schmidt, and our VP of Operations – Torina Boatright) for driving flawless execution across all engagements in 2017. The star is a perfect symbol for high-achievement. Stars dot the expansive sky, sparkling across the highest reaches of our universe. They’re bright and luminous and dazzling. With that said, there are stars among us, and our recognition not only helps them to shine brighter, but helps us to see our own possibilities more clearly. When you hear the term “Shining Star” in the workplace, you may envision a person of high caliber who has achieved something of note. Our “Shining Stars” possess a wide range of qualities. They are reliable, dependable, and proactive. They take initiative, and are diligent, dedicated, committed, hardworking and loyal. 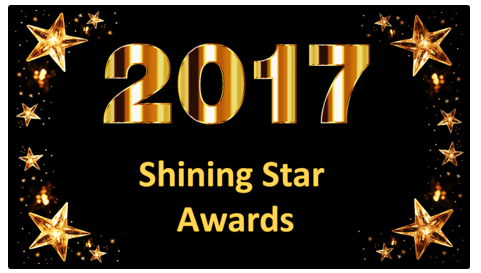 We can’t end our review of 2017 without recognizing our Shining Stars as they all deserve to sparkle! Our Avatel Stars shine bright as we recognize their 2017 shimmering achievements! amazing year and feel a renewed commitment to the year ahead. Christmas is a time of celebrating and taking a break from the daily grind in life before stepping up again in the New Year. We believe that celebrating the Holidays together furthers co-workers appreciation for each other. 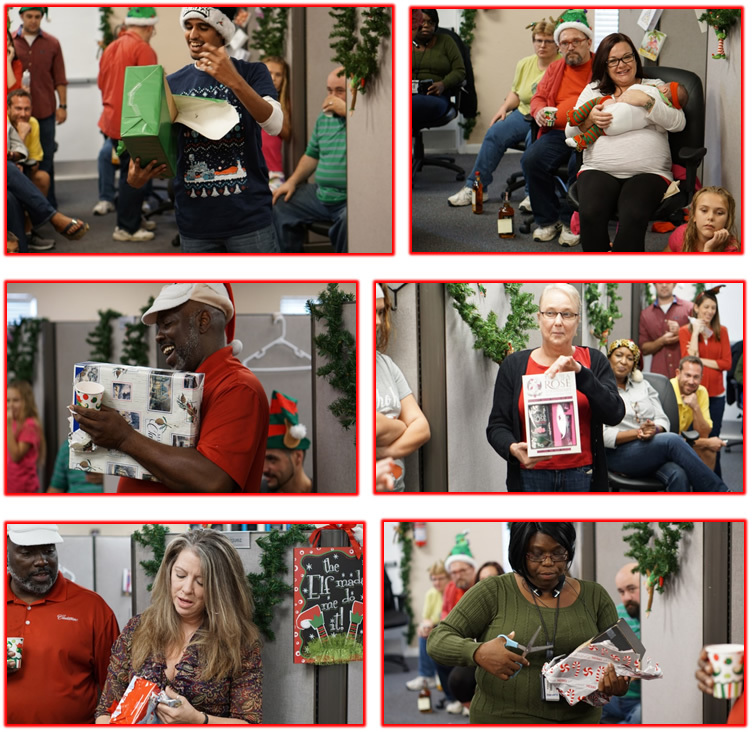 We started our Avatel Christmas celebration with a morning sugar rush with lots of sweet morning treats! 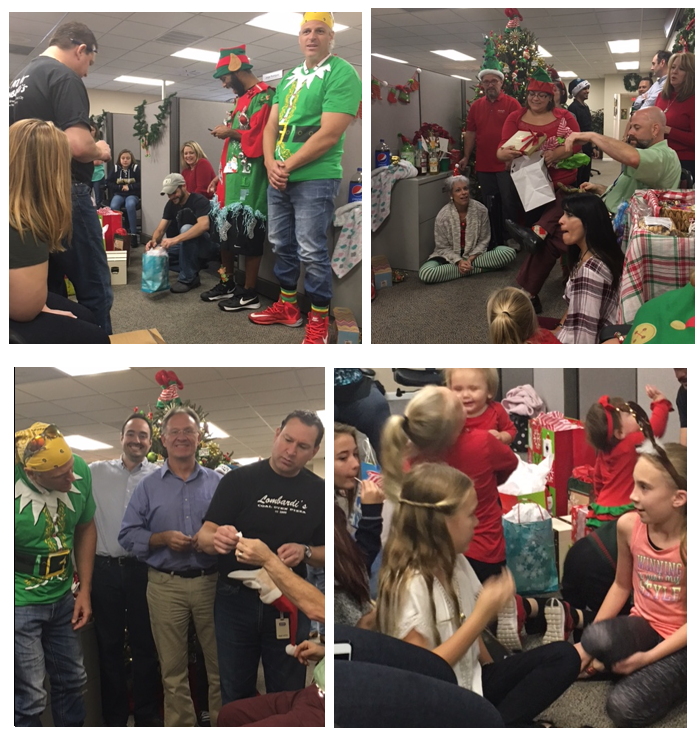 Then we joined in to play our Avatel Elf gift exchange game. Of course, during our game, Elf Bribing, Elf haggling, and Elf pleading was part of the fun. 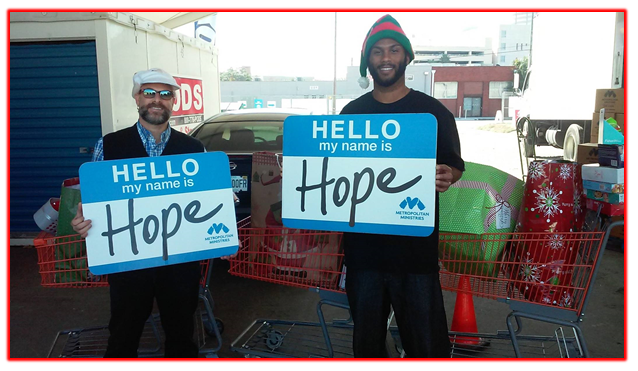 Avatel is proud to partner with Metropolitan Ministries again this year to provide toys to boys and girls. Donating to our Christmas toy drive is always a great way to brighten the holidays for children in need. 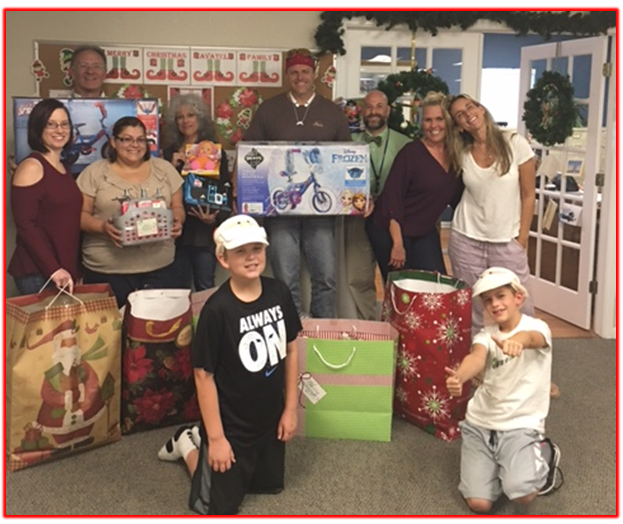 With that said, our Avatel Christmas Toy Drive ran from Dec. 1st through Dec. 20th, to provide Christmas presents for the children of families in need. 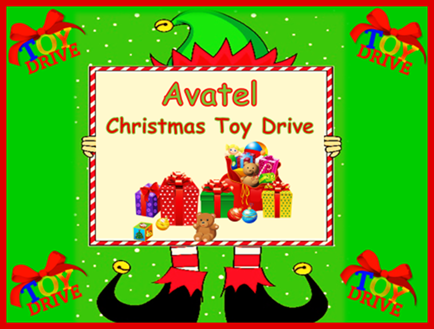 This year we outdid ourselves, as our Avatel family members donated 130 toys which is AMAZING! Everyone at Metropolitan Ministries was exceptionally thankful for the donations. Thank you to all Avatel Family Members for your generous and kind donations. The Harvest symbolizes abundance and the fruit from a season of work and sacrifice. It is a time of year that the farmers get to celebrate and are rewarded for sowing, watering, fertilizing, and protecting precious seeds. The concept of the Harvest extends beyond the hardworking farmers and into our daily lives as it could be a personal or work goal. Day in and day out we do the activities that are necessary to achieve our goals. Sometimes there are set backs and sometimes the plan works to perfection, in the end, we celebrate the Harvest. In other words, you will harvest that which you plant. Metaphorically, it means that you will obtain results in accord with the actions you take, or not. 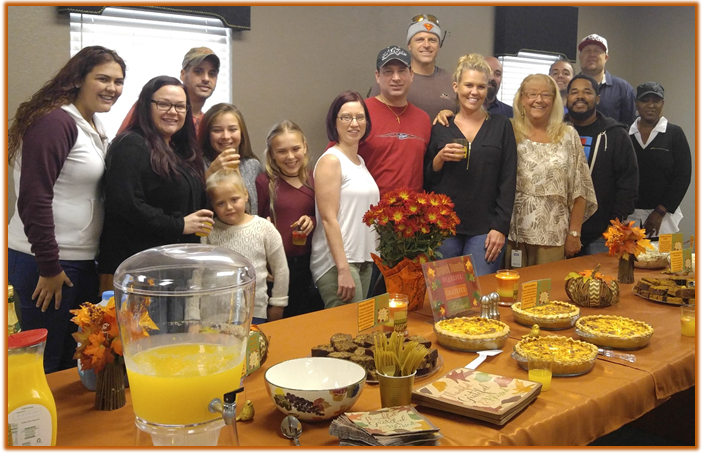 The Avatel family celebrated our Thanksgiving time with each other at our traditional Harvest Brunch prepared by Wrights Gourmet. Several years ago, I wanted to have our Thanksgiving meal time together represent the “Harvest” as a time of reflection and accomplishment, as bringing in a harvest has always been a season of great celebration. Let us all embrace the beauty of this season, celebrate the holidays with friends and family, but we can’t forget to plant the seeds now so that you are one day closer to the Harvest. We believe that nobody in America should go hungry, especially at Thanksgiving. 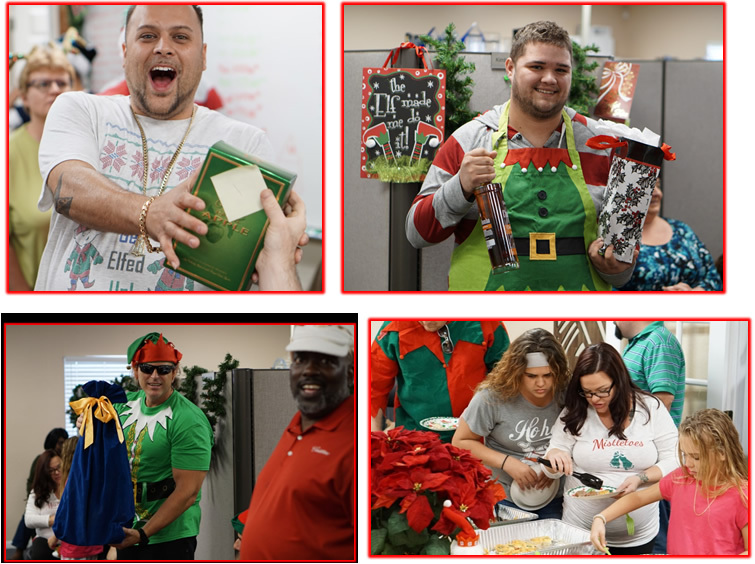 As a tradition at Avatel, every year we team up with Metropolitan Ministries to provide holiday meals for struggling individuals and families in our community. Our food drive is a great way to provide a sense of hope for the day and warmth in their tummies and hearts. When you sincerely give of yourself, with no agenda other than to celebrate the pure spirit of giving, you truly experience life in all its richness. At Avatel, we believe that the opportunity to give to others and make a real and positive difference, is the great promise of life itself. 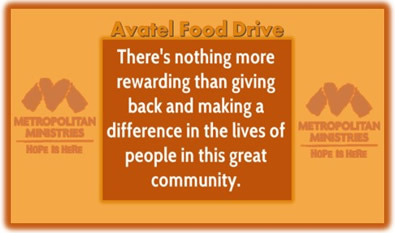 Thanks to all the Avatel family members, we were able to donate 325 pounds of food to Metropolitan Ministries. Double, double, toll and trouble. 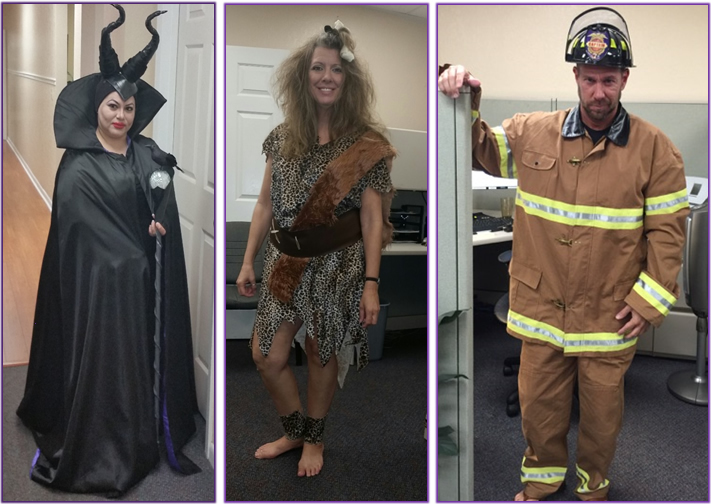 At Avatel, fires burn, and cauldrons bubble…They say it’s only Hocus Pocus but Halloween is our focus. Haunted house and creepy ghosts, what do you like the most? 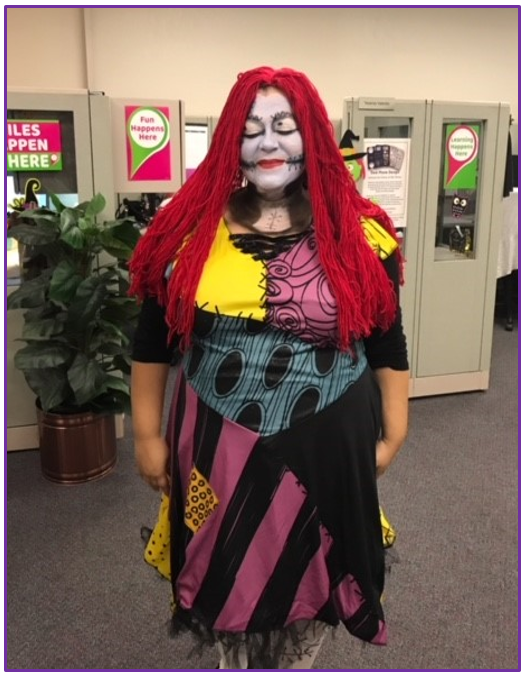 We enjoyed the day with a call center full of fun and creepy costumes, a bite to eat and a fun happy hour. 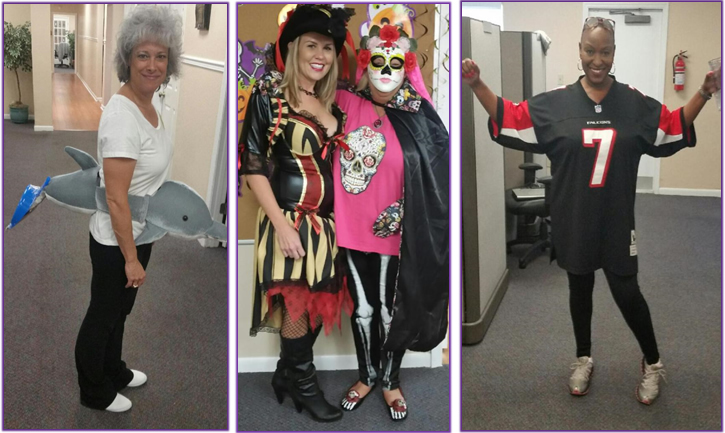 Prizes were awarded to the “scariest” costume, the “funniest” costume and the “best overall” costume. Customer Service Week is a nationally recognized event, celebrated annually during the first full week in October to honor the people who serve and support customers with the highest degree of care and professionalism. 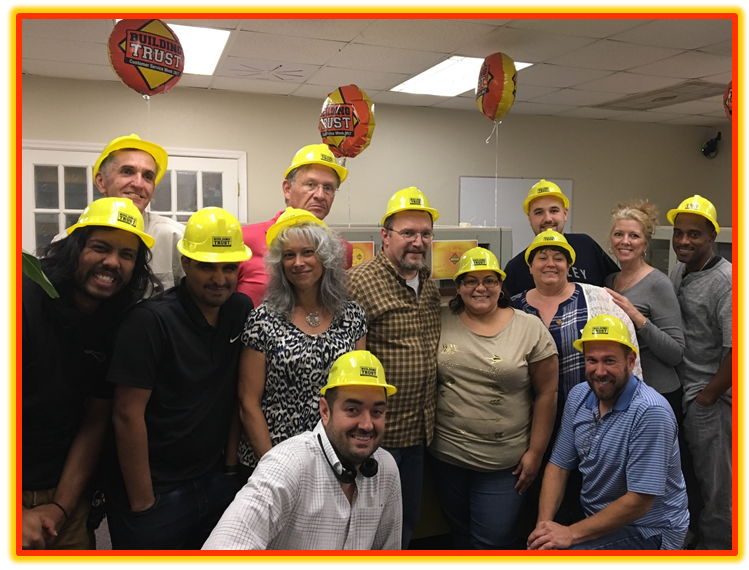 Avatel was proud to celebrate Customer Service Week 2017, October 2nd – October 6th. This was our 7th year participating with other service professionals world-wide. 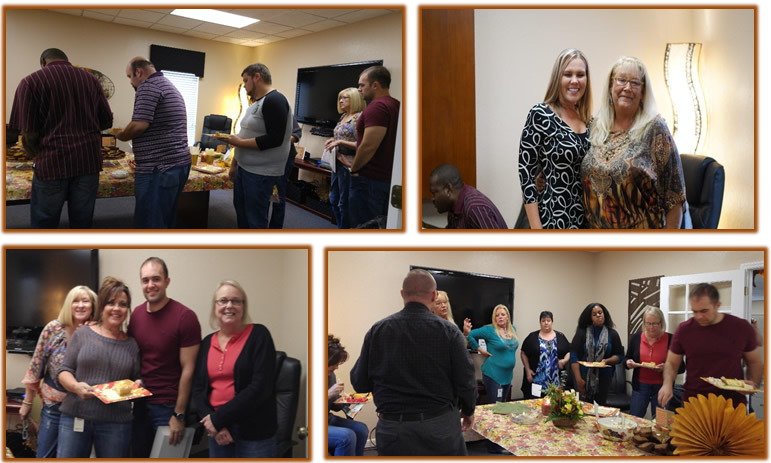 We joined them in celebrating our Service team as Customer Service Week is our greatest opportunity to show the Avatel Service Department staff that we appreciate their hard work and dedication!!! 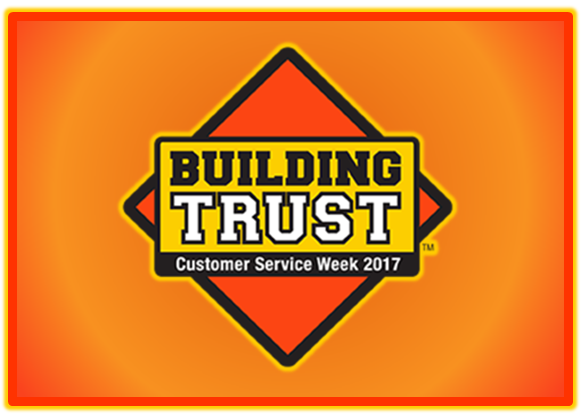 This year’s Customer Service Week theme was “Building Trust”. The “Building Trust” theme recognizes the importance of trust in forming strong, productive, and lasting relationships with our customers and Avatel coworkers. Having a truly successful business is based on one simple concept: TRUST. 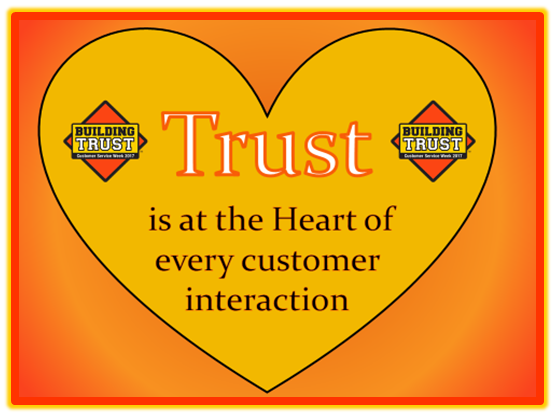 Trust is the basic framework for all customer relationships. It’s a proven fact that building customer trust in our products, our service and our company is the best way to build a loyal customer base. If we place building customer trust at the top of our priority list, we’re likely to find our investment paying off in customer loyalty. The more investment Avatel makes on providing great service, the lesser time it will take to gain the trust and loyalty of our customers. And, just as important as building trust with our customers, it is equally import to build trust with our co-workers. Building trust with coworkers improves efficiency, attitude, and confidence. We all know that trust is the foundation for teamwork. Trust with co-workers says, “I trust that you are competent to do the work, that you’ll share relevant information, and that you have good intentions towards the team.” Taken broadly, that’s trust about communication, commitment, and competence. We started our week with a “Trust is the Foundation” Breakfast with special gifts handed out to make the week memorable. On Tuesday we followed with a “Trust More and Stress Less” Day with all our Service team members receiving well deserved chair massages. 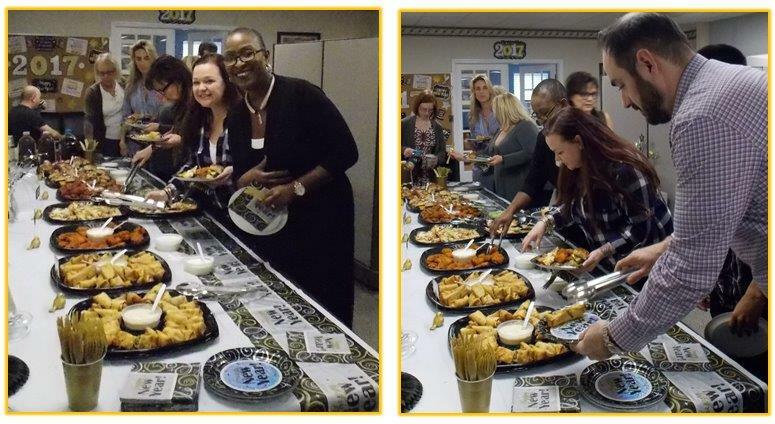 On Wednesday we enjoyed our “Trust Circle” Thank you lunch -presented to the service team members as an Italian Buffett, along with gifts to celebrate our Service Team Members. 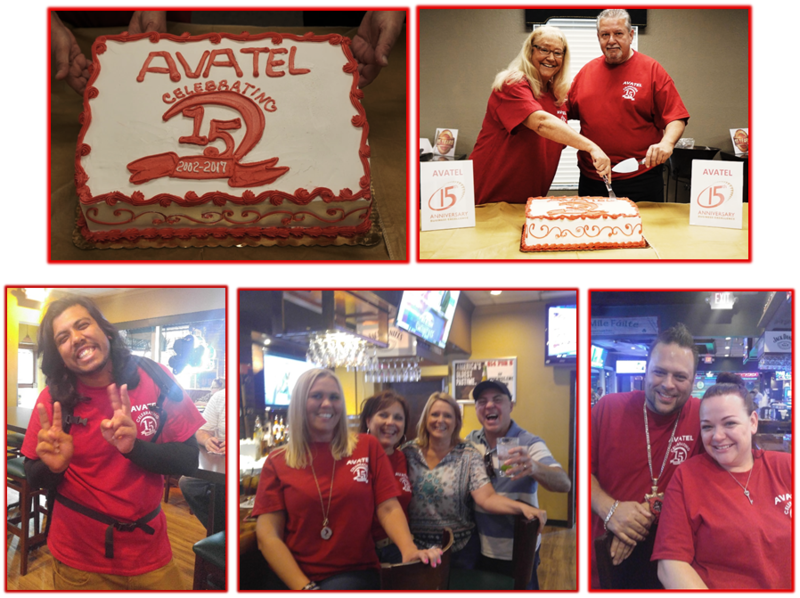 We finished the week off right with our “Trust Builders” Recognition Dinner – so we could show Avatel’s appreciation for all of our service team members hard work and dedication. We build trust through all of our actions and every interaction we have with customers and co-workers. We build trust one step at a time. Trust is fragile but strengthens over time with – you guessed it – MORE TRUST! Each anniversary of our company’s beginning represents the end of a chapter and the simultaneous start of another. 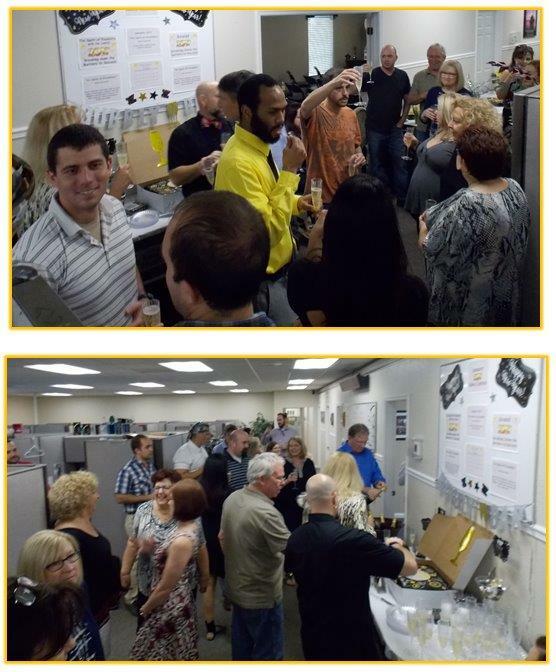 May 16th was a special day at Avatel. It was our 15th anniversary. This milestone anniversary was is a time for celebration and reflection. A look back at the incredible challenges and persistence that brought us to where we are today. Milestones are an important way to reflect on where we’ve been and reaffirm our commitment for the future – and we all agree that those things are worth sharing and celebrating. 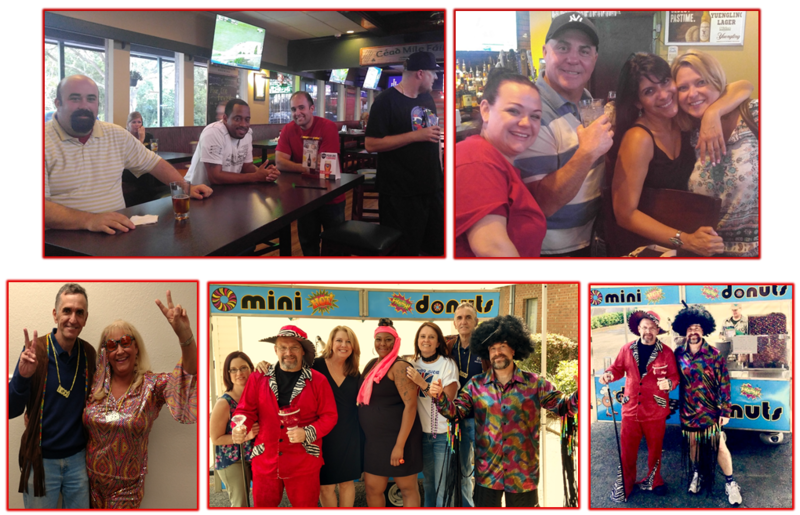 As part of our 15th Anniversary celebration, we decided to let loose and liven up the Avatel workplace with a Spirit Week. 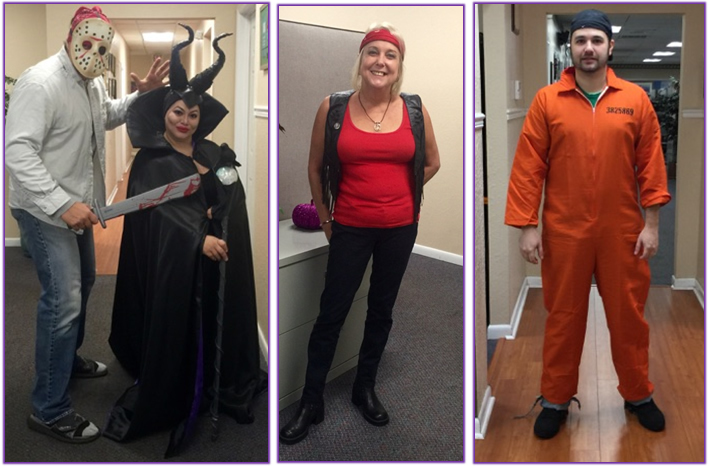 No question about it, Spirit Week at Avatel is one of our favorite weeks. The point of Spirit Week is to promote spirit and enthusiasm. 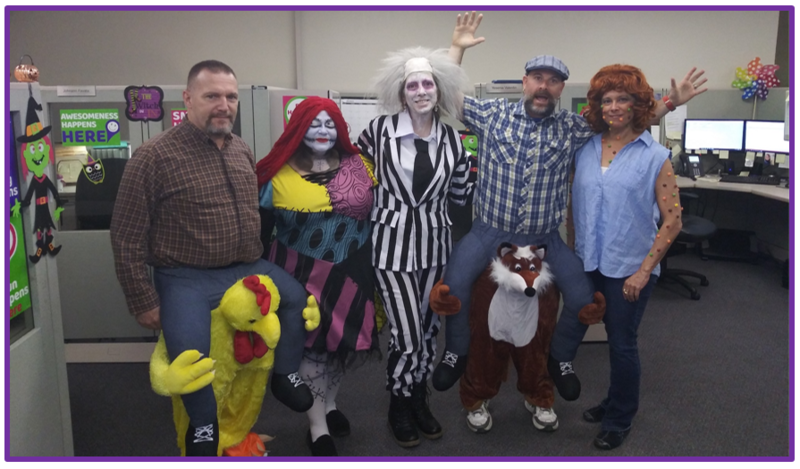 Spirit Week at Avatel is also a time to let our creativity run wild. There’s just something about the camaraderie, big fun, and getting crazy with our teammates that really unites us as a company. Sweet Dreams Monday (Pajama Day) – We came to work in our comfy pajamas and cozy slippers and enjoyed fresh coffee, juice and a bagel buffet. 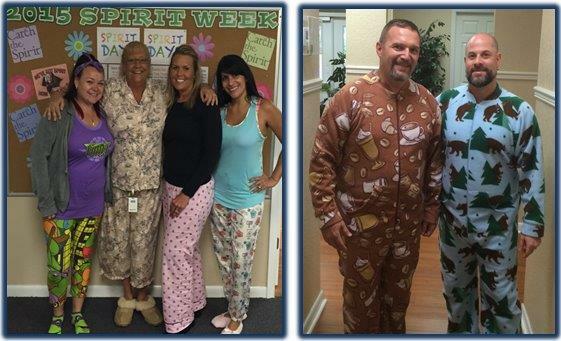 We all enjoyed Pajama Day and the ultimate comfiness at Avatel. 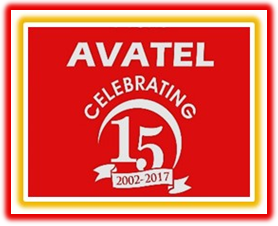 Terrific Tuesday Celebration (Avatel’s 15th Anniversary Day) – We all celebrated the day in style in our 15th anniversary t-shirts and enjoyed a fabulous catered lunch and a commemorative anniversary cake. In the evening Steve Caphone form our Financial Partner CIT treated the team to happy hour. 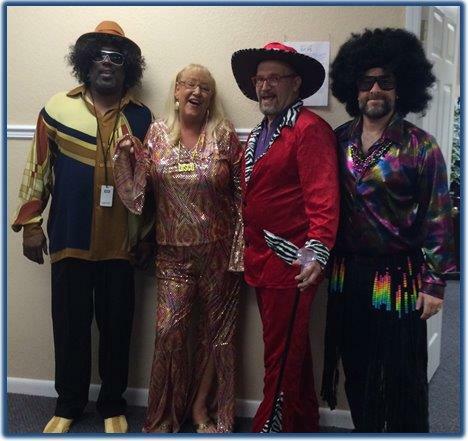 Wacky Wednesday (Disco day) – We went back in time to the Disco era, with our sequins and bright colors, bell bottoms and flashy jewelry. We will also had the DISCO DONUTS mobile mini-donut cart come to the office to serve hot, fresh mini-donuts while playing Disco music on our patio. 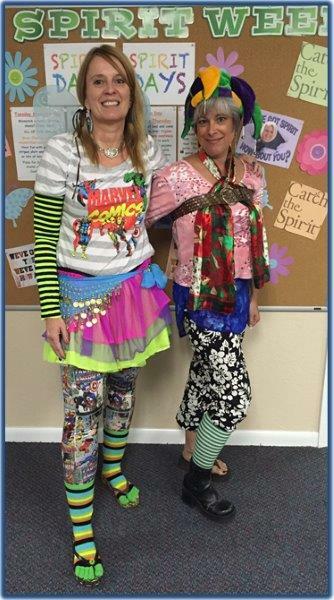 Twisted Tacky Thursday (Crazy Mismatch Day) – We enjoyed a pizza lunch in our mismatched clothes, shoes, socks, wacky hair, etc. There were no rules, except to make a bold, fun impression from head to toe. Fun in the Sun Friday (Beach Day) – We came to work dressed in our favorite beach attire (shorts and Hawaiian shirts, beach dresses, flip flops and straw hats). Enjoy water guns, a hula hoop contest and festive drinks from 3:30 – 5:30 on the patio. 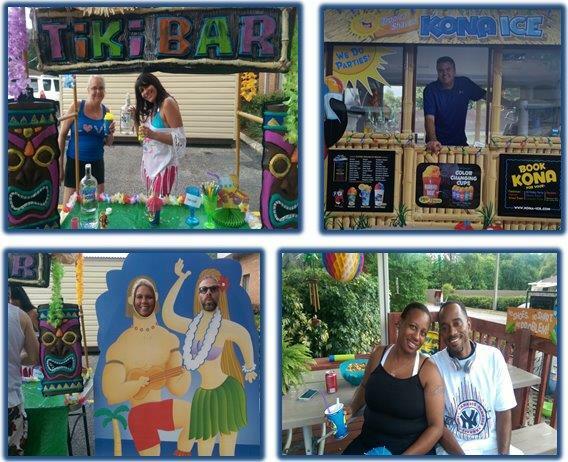 The Kona Ice truck will serve up your choice of tropical shaved ice drinks, along with our adult beverages at the Tiki bar. 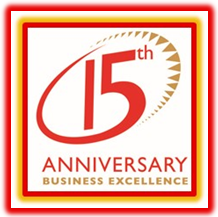 We are excited by this milestone and very proud of the business that we have built over the last 15 years. We are both extremely proud to look back on all we’ve accomplished and overcome as well as extremely excited about our future and the opportunities it brings. Companies, like people, change over time, accomplishing things they didn’t once believe were possible. 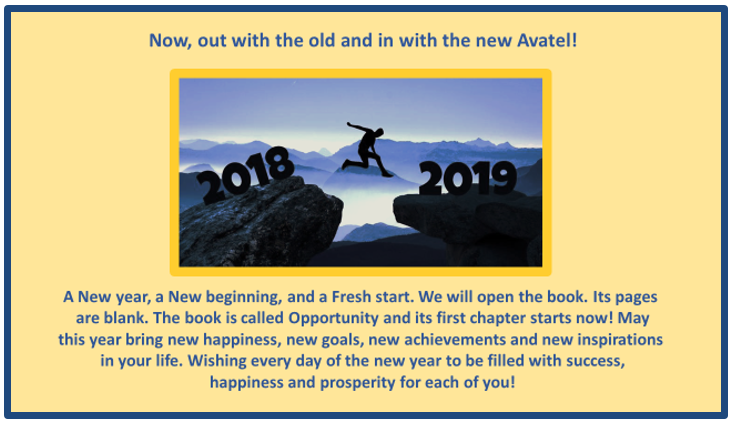 We believe, and always have, that it’s because of the great people in our organization that we are able to continue to achieve new goals and create opportunities at Avatel. 2016 was a year of great success for Avatel. It’s important to take time to reflect on all that we’ve accomplished and acknowledge that our company performs at the level we do because of the talents and dedication of our people. 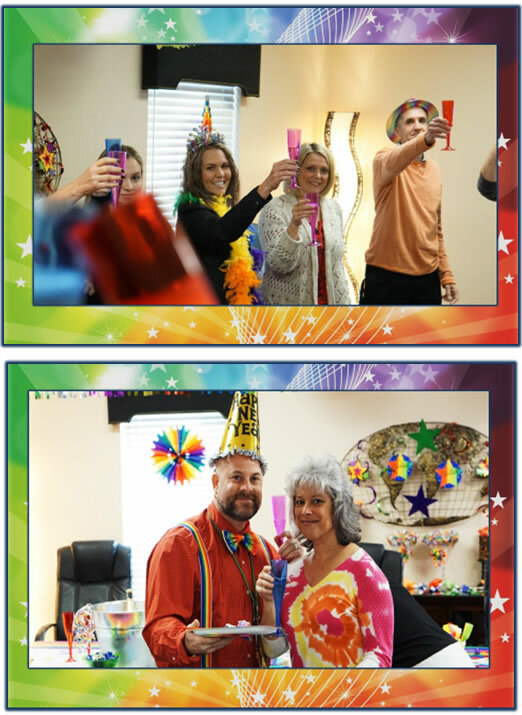 So, before we close the book on another year, we celebrated with each other during our 2016 year-end awards luncheon. Avatel has established a culture where there is a passionate commitment to excellence characterized by high productivity, full engagement and dedication by all team members. 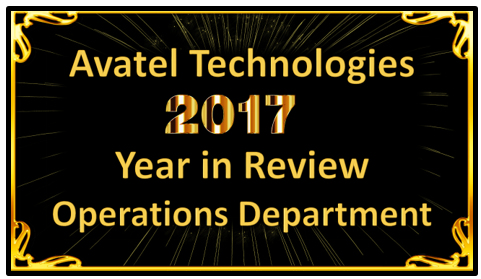 As we look forward to the New Year ahead, it is an important time to reflect upon the contributions, accomplishments, and successes of our Avatel team members. Our sales results for 2016 were quite impressive. We recognize that the sales group has consistently achieved, and often exceeded, their goals throughout the year. We know such an achievement does not come easily, and we complement each of our sales representatives on their dedication and hard work. 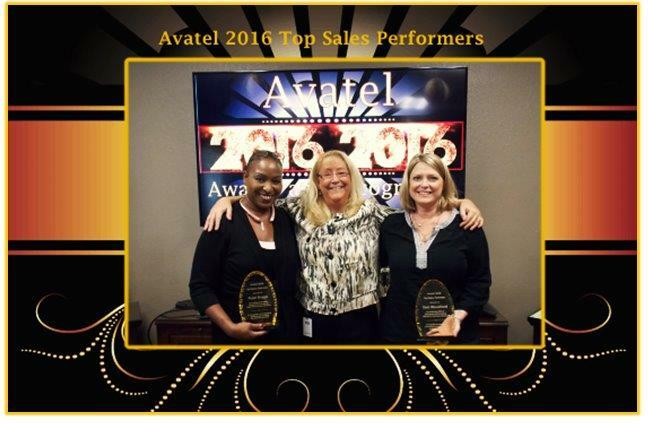 Avatel is fortunate to have such energetic, talented salespeople on our team and we look forward to more success in the future. Join me in congratulating our 2016 Top Performers for their dedication and hard work throughout 2016! It is an honor for us to have Rujel and Deb on our team! One reason that Avatel is so successful is that we have dedicated employees whose efforts surpass what is required of them. Avatel has a Service group that consistently goes the extra mile for customers, colleagues, and the organization itself. The speed and efficiency of the people assigned to handle and manage service tasks contribute tremendously to Avatel’s growth and expansion. The spirit of this team blend together to create an environment that is, in one word, outstanding. Our PM’s exceed our customer’s expectations and bring a higher set of quality and customer service standards to our industry. Their desire and willingness fuel our mutual efforts and lead us to success. We thank our Project Management team for the fantastic job they do every day. Words just can’t describe how much they are appreciated. We exist because genuine passion runs deep within our company. We have a team of highly experienced technical experts who are committed to delivering excellence to our customers and their co-workers. The above does not reflect the additional work that is performed by our Engineer’s on a daily basis, such as: Systems programmed at Avatel, Field installs, Legacy dial-ins, does not include multiple configs for same customer. Numerous after-hours work on assorted projects. The service our Engineer’s provide, exceeds all expectations and guarantees Avatel’s continued success. We’re better because of them. We thank our Engineer’s for all they do! The operations group drives flawless execution across all engagements. They are responsible for developing operating policies and processes, and driving operational excellence at across the organization. The Finance Group processed 109,040 financial transactions. This includes; invoices, bill payments, credit cards, deposits, purchase orders and journal entries. This does not include CRM/Vault activity, contractor bill posting, invoice payments, and sales tax, as well as collection efforts for non-payment. Avatel’s HR (Brandye) is responsible for functions such as Avatel’s payroll administration and commission reports. In 2016, HR processed a total of 1,078 HR functions related to missed punches, time corrections and time off requests. Avatel’s HR is also responsible for reviewing, securing, offering, and explaining Avatel benefits. Avatel’s Purchasing and Procurement team provides the right product, at the right price, at the right place and at the right time, to meet the needs of our customers and Avatel staff members. In 2016, the Purchasing Team placed 6,636 total orders for Hardware, software, maintenance, internal requests, and MOH orders. This does not include, returns, packing and shipping and other activities in 2016. 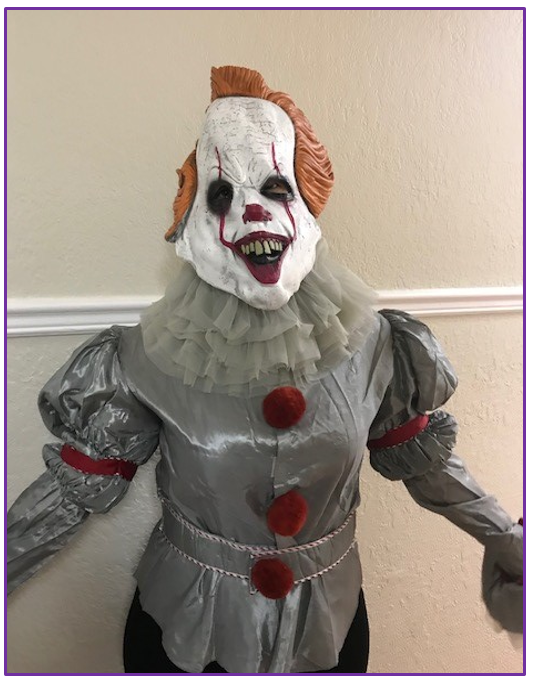 Our IT dept. is responsible for setting up and making changes to Avatel’s existing workstations, maintaining operating systems, email, anti-virus programs, maintains and updates Avatel’s CRM and Vault. Installs and maintains all Avatel web-site setups, content, manages web software, and monitors site performance. In 2016 there were 133 major CRM updates and 11 Vault updates. Our Empowered Operations Team has a significant reach and impact throughout the organization. We thank them all for making 2016 a success. We couldn’t have done it without them! The clue to successful continuous improvement is in the name. It must be continuous so that opportunities for growth can be highlighted, improvement made and measured and evaluated. Continuous improvement is as much about mind-set as it is about actions. In 2016 we had 166 CI improvement suggestions. Out of the 166 suggested improvements, we had 95 approved and completed, 7 approved and in process and 10 still in review or on-hold. For Avatel, continuous improvement is a way of life, not just a fad or program of the month. It is one of the keys to Avatel’s success. “Rising Stars” For working to improve their performance and reach the next level of success. “Shooting Stars” For being reliable, dependable, proactive, self-motivated and taking initiative. “Shinning Stars” For the drive and the will to succeed, and consistently going above and beyond what their job requires. Rising Star – Yesie Valentin (PM) – Yesie has worked very diligently to develop a solid understanding of the processes associated with her role by always reaching for the next level of expertise. She continues to build upon this knowledge and her grasp of the principles of the position and applies these skills well in the course of her support of our customers. Great job Yessie! Rising Star- Chris Perez (Engineer) – Chris only being here for a short time has absolutely slaughtered the tasks, along with growing his knowledge with the IP Office and IP telephony. He jumps at any opportunity for learning something new and with that motivation has been able to assist in the advance requests of customers. Thanks Chris for becoming a valuable member of our team! 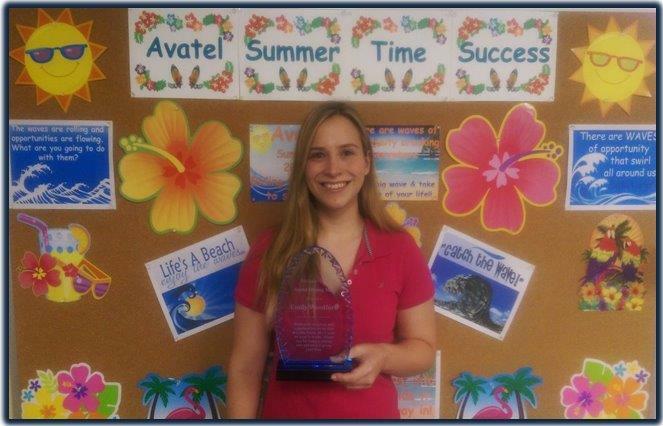 Rising Star – Myra Ourso (Sales Associate) – Myra has been one of Avatel’s most consistent AE’s. Not only has she met or exceeded quota several years in a row. She is always focused, driven and on top of her calls, data, activity and updates. Myra is always willing to help her peers and has no problem pushing people to the “edge” so they can succeed. Thank you for being such a great team player and employee Myra. Shooting Star- Frank Peraza (Engineer/Technician) – Frank is one to count on for any project. As his dedication and attention to detail to the job is unsurpassable. He is in early every morning and doesn’t leave till the job is done. We appreciate all your hard work and dedication Frank! Shooting Star – Annette Duarte (Finance) – Annette consistently works to manage a huge degree of the finance related tasks necessary to maintain the optimum workflow in the Operations department. She positively manages vendor, customer, and resource relationships. Thank you for your care and dedication to Avatel. Shooting Star – Joey Martinez (Purchasing) – Joey is consistently vigilant in ensuring our ordering process is seamless and cost effective, he is always looking for the best savings for Avatel without prompting, and continued to take the initiative to grow and optimize his direct department for better productivity. He’s taken on several new processes using vendor and manufacturer’s websites to ensure orders flow in the most effective manner. Great work Joey, thanks for all you do! Shooting Star – Tom Wood (PM) – Tom’s approach to managing his projects reflects a high level of attention to detail and a conscientious effort to maintain visibility and control of every aspect of support. He does so by demonstrating the values associated with the spirit of this award. His reliability and proactive methodology make him a very valuable member of the Project Management Team. Great work Tom! Shooting Star – Rujel Buggs (Sales Associate) – Rujel was a sales machine in 2016. What a year it’s been for you. Personally, you had one of the biggest roadblocks a person could come up against, you took the big “C” head on and sent it packing. We can all hear you say “Ain’t nobody got time for that”. Professionally you kept focus and didn’t skip a beat. Your dials and units have been consistently near the top. You wound up finishing top 3 with at least 2 months out and you were still able to increase your sales revenue from the previous year. Nothing will hold you back! Thank you for always wanting to be the very best. Shooting Star – Deb Woodford (Sales Associate) – Deb consistently rises above and sets a positive example within the organization. Always willing to help her peers and support management when needed. She had a great year and with her continued dedication, focus and commitment she was able to increase her revenue substantially from the previous year. Proving that she can do anything she puts her mind to. Not only did you blow away your numbers. You made the biggest improvement overall, you were top overall sales for 2016 and top “Product” Sales for 2016. Congratulations and great job! Shooting Star – Emily Woodford (Sales Support) – Emily is a valued employee and plays a huge role in supporting the Avatel Sales Team. She consistently works with the team and management to develop and improve that sales approval process although this is a tough role, Emily takes pride in job and we know that we can ALWAYS count on her to make the right choices and she will look out for the company and our employees. Emily thank you for all that you do. We love and appreciate you. Know that everything you do is valued and doesn’t go unnoticed. Shooting Star – Brandye Byers (Finance/HR) – Brandye made it her mission in 2016 to move beyond her existing responsibilities to take on a more management focused role in the Finance Department as team leader with the future goal of a true management role. She has been the primary owner of Finance oversight for the entire year and has taken the initiative to attend learning courses from external sources that provided more in depth understanding of financial mechanizations and overall financial planning. She took the initiative to learn more about the management of other departments to ensure she understands the integration and the decisions made that will ultimately impact the finance department and the organization as a whole. She consistently provides feedback and input to all departments at all levels. Thank you Brandye for your dedication and hard work! 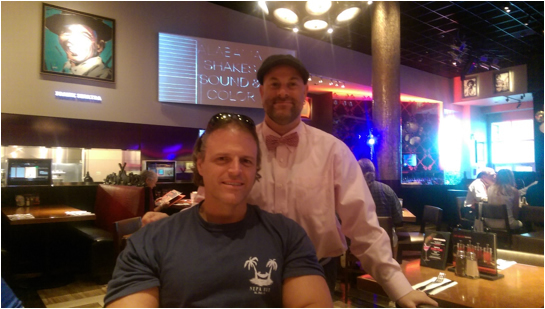 Shining Star- Jon Damiani (Engineer) – All year, Jon has gone way beyond his initial work expectations. A dedicated hard worker that his day doesn’t end at 5:00, but ends when the work is finished. Time and time again I’ve seen Jon put in 16 hour days and still come into work the next day. Always willing to take on additional responsibilities to help out the team. Thank you Jon for all your hard work and dedication. Shining Star – Keon Hines (Purchasing) – Keon has really stepped up beyond the day to day tasks to learn inventory management, ordering, returns, etc. He’s consistently communicating and providing feedback to better improve processes and works exceptionally well with the Sales and Service Team to manage and integrate their processes for seamless workflow of orders. Great job Keon! Shining Star – Joe C. (IT) – Joe consistently is looking and implementing enhancements to our systems to ensure we have the tools necessary to ensure productivity as cost effectively as possible. He always looks for solutions to accomplish any programming request, never saying “not possible”, until he has researched thoroughly and determined it is absolutely not possible. He has also developed a solution completely independently and offered Avatel first option to front market in 2017 as a potential new source of revenue for the business. Great work Joe! 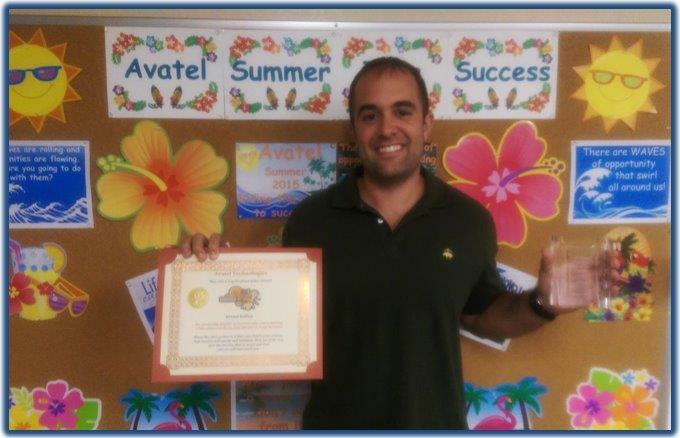 Please join me in congratulating our Avatel Star’s!! I want to take this opportunity to thank everyone for all their efforts throughout the year. The success of our company is built on the efforts of our team members and in this past year, we have enjoyed many successes. Thank you for the dedication, loyalty and commitment to Avatel. No time of year ever feels as motivational or inspirational as the turn of the calendar into a fresh new year. It’s exciting, full of hope and promise. This year, we are capturing “the Spirit of Possibility with No Limits”. We must be a company that looks beyond the confines of business convention and into a new future; a company who sees opportunity where others see obstacles, by demolishing barriers and revealing the virtually limitless opportunities ahead in 2017. 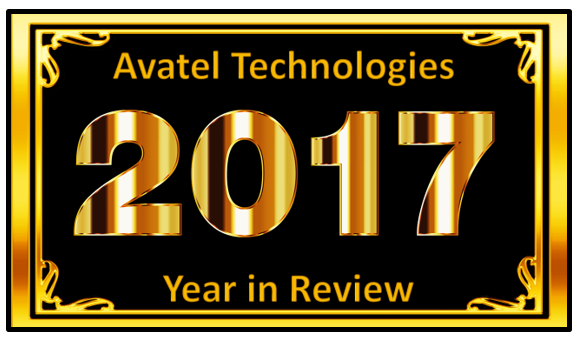 I want to thank each of our Avatel team member’s for your contributions to Avatel’s success in 2016. Without your commitment and high standards, we would not be the thriving company we are. I am very grateful for your efforts. I hope you all had an amazing year and feel a renewed commitment to the year ahead. 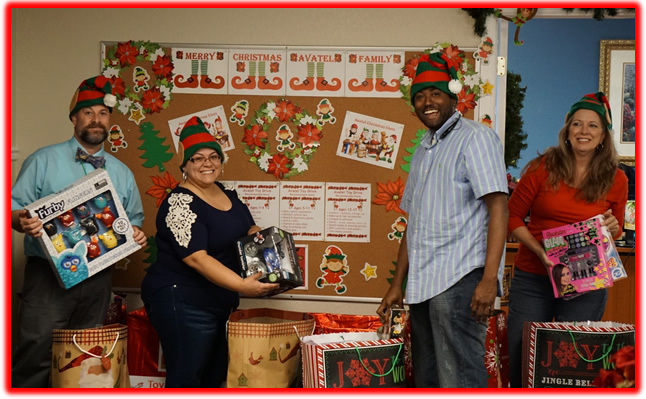 Thank you to all Avatel family members for helping to make our annual Christmas Toy Drive a huge success! We are so appreciative to everyone for making this year’s drive our most successful to date! We would especially like to thank Angela for her thoughtful donation of bicycles. At Avatel, we believe that Toy drives are a great way to support a very worthy cause – bringing the Christmas spirit to the less fortunate! Your donations brought smiles to the faces of needy children during a magical time of year, as they felt the joy of the season made possible by your kindness and generosity. There’s something about the holiday season that changes people, even if for a brief moment. Relationships are strengthened, hearts are mended, people forgive, and in some cases lives can be changed forever. It is truly is magic. We all must remember that believing doesn’t always require seeing. Just as younger children learn to believe in things they cannot see – like friendship, faith, and hope. For me, the magic is about family, and happiness, and traditions and love. Throughout our lives, we need the capacity to believe: in ourselves, in our friends, in our talents, and in our family. We also need to believe in things we can’t measure or even hold in our hands. I am talking about love, that great power that will light your life from the inside out. What a joy it is to celebrate the Magic of Christmas with each other. The joy of brightening other lives, bearing each other’s burdens, easing other’s loads and supplanting empty hearts and lives with generous gifts becomes the Magic of Christmas. We should all retain a sense of wide-eyed wonder and understand that magical moments are possible, not only at Christmas but throughout the whole year! Thanksgiving is a special time of the year when people celebrate the things they are most thankful for. The Thanksgiving holiday season is an opportunity to focus on, and be reminded of, the positive aspects of our work lives. In its earliest incarnations, Thanksgiving was rooted in work as it was a day to celebrate the hard-earned bounty of the harvest. The harvest has always been a beautiful and important part of life on earth, the time when the year’s work bears fruit and the people are fed. It is symbolic of bounty, health and abundance. 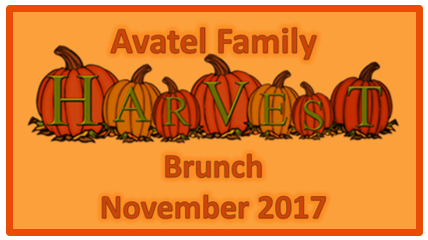 At Avatel, we celebrate the day before Thanksgiving with a Harvest brunch. This is a time we all gather together, enjoy good food and drinks, and show our gratitude to each other. We believe that gratitude is a powerful way to strengthen relationships and establish a positive workplace culture. The power of appreciation and gratitude is especially felt on the holidays and during special times in our lives, but we can enrich our lives and contribute to creating a healthier and more satisfying workplace culture by practicing a little bit of gratitude every day. When we seek to expand gratitude and graciousness to our co-workers, we cultivate the emotions that create positive self-supportive energy within us all. At Avatel, we have created a culture of gratitude, in which appreciation and positive energy are the norms rather than the exceptions, a culture in which people feel valued for their work and help those around to do the same. Leading with appreciation has created a positive work place culture for us all. The person who plants selfishness, ignoring the needs of others, harvests a crop of weeds. Any roots of bitterness, ungratefulness, pride, or jealousy, will destroy the possibility of an abundant harvest. If we want our lives to have an abundant harvest spilling over, we need to rip out the old roots and weeds and plant the seeds of kindness, care, compassion and gratitude. At Avatel our harvest is always plentiful! 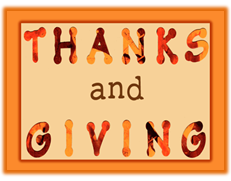 The month of November at Avatel is all about “Thanks” and “Giving”. We believe that it is through thanks and giving that life’s greatest joys are created. When you give, you open your heart to life and allow great measures of abundance to come pouring in. And, when we are thankful we experience greater levels of optimism, positive mood and feelings of belongingness. Giving is what keeps us connected. “It is more blessed to give than to receive” is a simple truth, even self-evident, yet magnificently profound and powerful. By sincerely giving, we no longer must merely believe that it is more blessed to give than to receive. By giving of ourselves, we know and experience the reality of that beautiful truth. The unfortunate reality is that many families do not have the means to enjoy a hot meal on Thanksgiving Day. We believe that nobody in America should go hungry, especially at Thanksgiving. 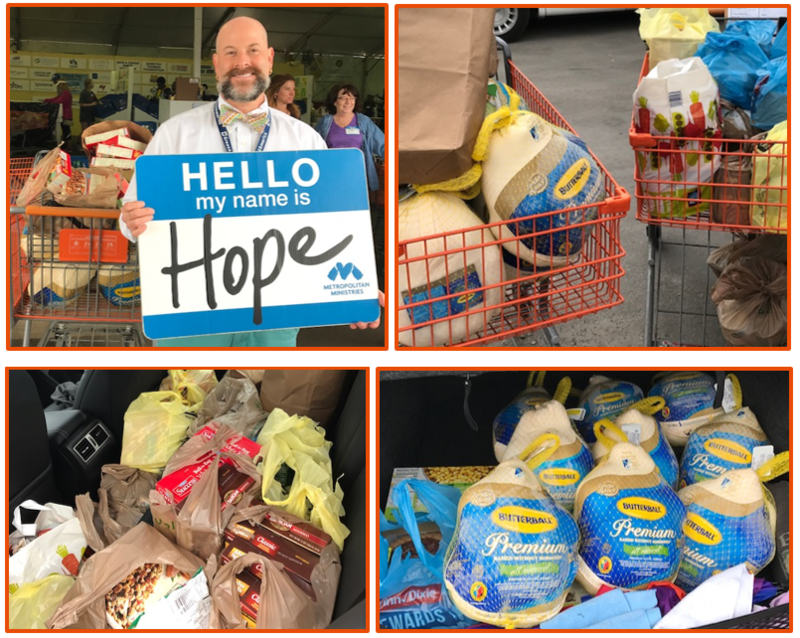 Every year, Avatel teams up with Metropolitan Ministries to provide holiday meals for struggling individuals and families in our community. 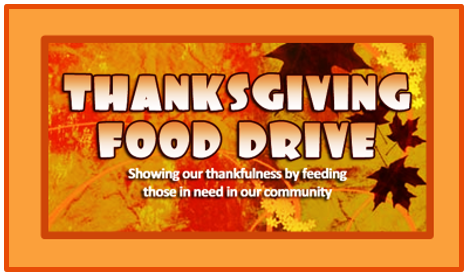 Our food drive is a great way to provide a sense of hope for the day and warmth in their tummies and hearts. This year we were able to donate 554 pounds of boxes and canned goods, along with 10 turkeys. The more we give of ourselves, the more we strengthen our own unique aliveness. The gifts we give become part of the world around us, where they grow in value with each life they touch. Each day is rich with opportunities for you to make a positive difference in the lives of those around you. On November 1st 2016, Avaya announced the Avaya Edge program for fiscal year 2017, its newest global channel partner program. Avaya Edge replaces Avaya Connect, which launched nine years ago. The overall goal of the Avaya Edge Program is to drive a high level of customer satisfaction by supporting and empowering the partners’ long-term growth and profitability by providing the tools to succeed. The Avaya Partner levels (Platinum, Gold, Silver and Authorized) moved to the new Avaya Partner Gem levels as part of the Avaya Edge program. 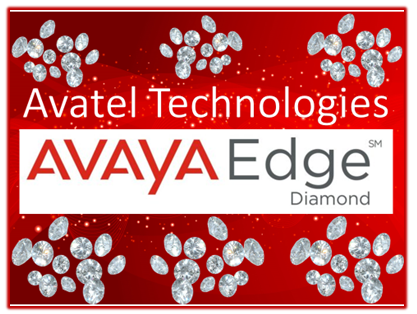 The new Avaya Edge Gem levels for Partners is now Diamond, Sapphire and Emerald. 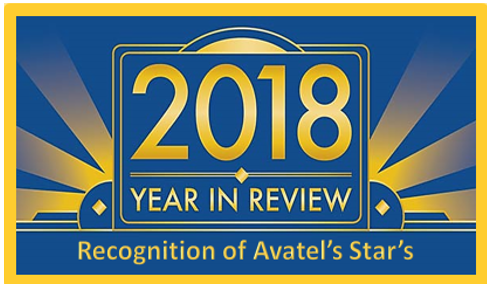 Throughout the years, Avatel has been recognized for revenue growth achievement, has acquired the highest level of credentials in sales and design, and has demonstrated excellence in customer satisfaction. However, under the old Avaya Partner program we were unable to move from a “Silver” level partner status. With that said, the Avaya Leadership Team made a visit to Avatel to reveal our new Avaya Edge Gem level. 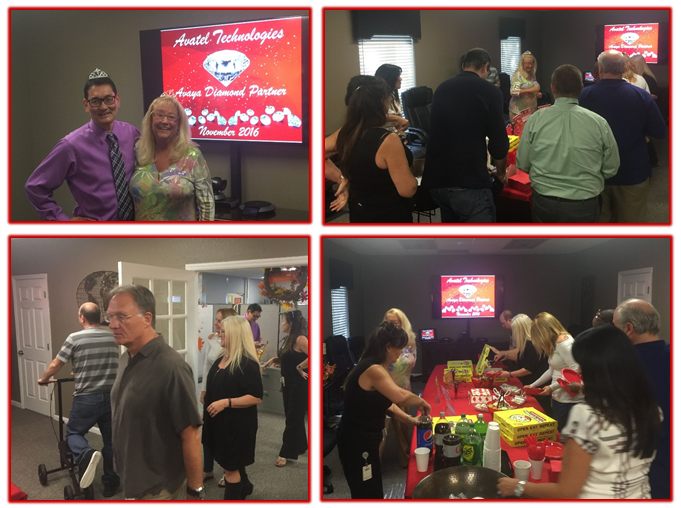 The Avaya Team held a celebration at the Avatel office to announce our promotion to Diamond status. We appreciate Avaya’s recognition of our many years of hard work and dedication to excellence. The new Diamond level partner status, is the highest ranking available. Reaching Diamond level with Avaya speaks to the standard of excellence, and is reserved only for partners that have demonstrated commitment and results. In the business world, Diamond status has always been the pinnacle of achievement. We are very proud of our Avatel staff members for achieving Avaya’s exclusive Diamond Partner Gem level. At Avatel, we believe that recognition serves as a tool for reinforcing the behaviors that drive excellence. Our recognition creates an environment where individuals feel appreciated for their contributions and their accomplishments. 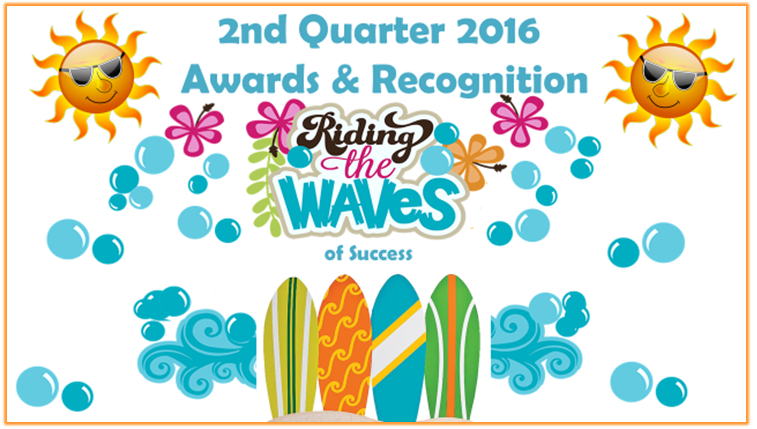 With that said, it’s time to recognize the accomplishments and contributions made during the 3rd Quarter of 2016. Next we announced the contributions to our 3rd Quarter results and the activity from our Service Dept. Engineering Team – 1,520 Completed Service Tasks, 141 Demo/Customer Presales calls/Tech calls and 20 New Product Configurations. Project Management Team – 1,490 solutions managed, 100 internal activity requests, 1,635 service tasks created and 22,295 Service calls handled with a 100.00% service level. Service Excellence at Avatel is a way of working, a way of interacting, and a way of thinking about our jobs as we work together with others. Service excellence takes effort, dedication and commitment. 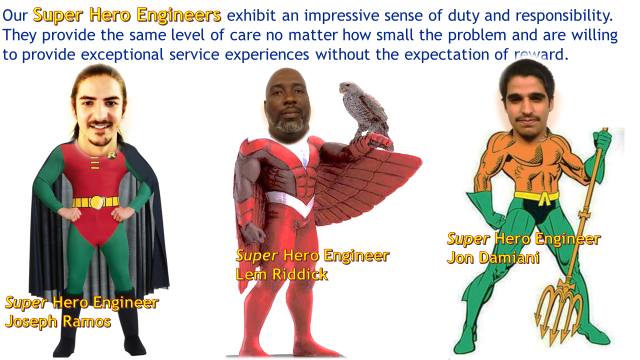 Service excellence is an attitude engrained in every Avatel Engineer and Project Manager. Understanding and effectively managing the operations side of Avatel is key to our success. The Avatel Operations Department is the backbone of all our business processes necessary for Avatel’s day-to-day functioning. Operations Team – The Finance Group handled 28,132 finance transactions, HR handled over 3,339 employee support transactions, and IT handled 44 CRM programming updates and performed 4 major Vault updates. Our Purchasing team processed over 1,743 product orders and employee internal requests. We appreciate our Operations group for striving for excellence across all engagements. 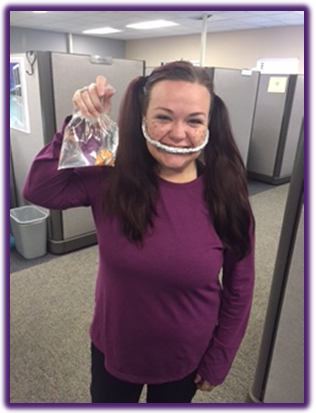 Deb Woodford – Deb consistently helps her co-workers (answering questions, making suggestions, sending motivating emails) all while maintaining her quota. Deb rises above and thinks outside the box. She is always looking for an answer or solution for her clients and co-workers. Thank you Deb for all of your hard work and dedication! Bryan Kelley – Thank you Bryan for assisting management and supporting the newer associates. It’s refreshing to know Avatel can count on you when a teammate is out, with no complaints, all while meeting or exceeding quota. Thank you Bryan – Your positivity shines and is appreciated. Way to go! Angela McKnight – Angela is on the Project Management team and consistently goes above & beyond with every single one of her customers. She openly accepts the ownership of the customer’s satisfaction from every perspective and she deserves to be acknowledged and recognized. Great job Angela! Shawn Roderick – The role of a PM involves a significant amount of multi-tasking and attention to details associated with the management of several orders. Shawn’s willingness to support extra tasks (outside of his daily workload) is evidence of his above and beyond behavior. 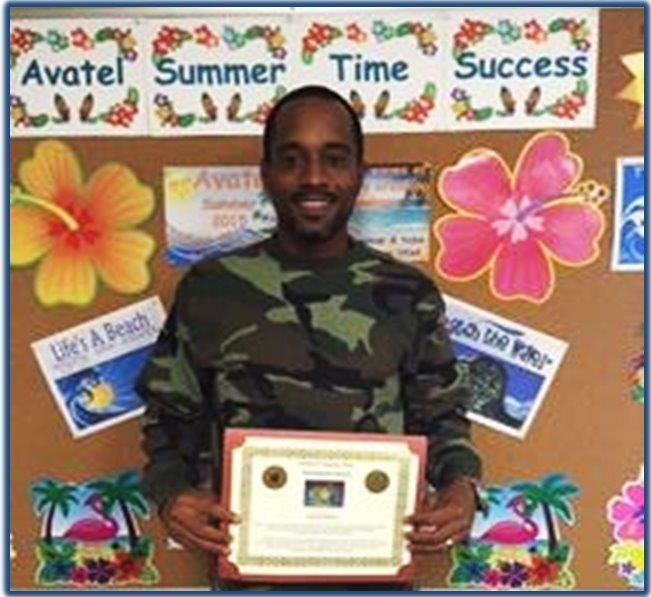 His overall attitude and capabilities are also evidenced by the multiple commendations he received from his peers during Customer Service Week. Thank you Shawn for your hard work and dedication! Jon Damiani – Jon has demonstrated diligence and dedication throughout his tenure as part of the Avatel family. Jon often goes above and beyond by staying after hours, at times as late as into the next morning. Along with tackling numerous daily emergencies, tasks and configuration requests, Jon has even volunteered to go to customer sites on weekends when an emergency arises. Jon’s attention to detail, enthusiasm, positive attitude and determination has greatly contributed to Avatel’s success. Thank you Jon for consistently going above and beyond normal expectations! 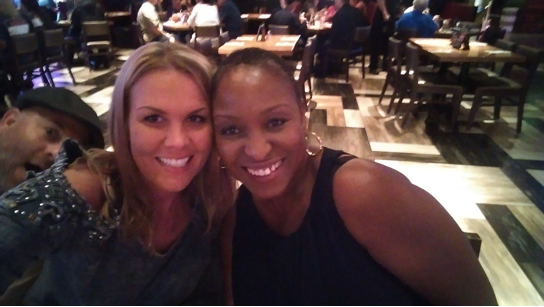 Emily Woodford and Rhonda Schmidt – for their unwavering dedication to Avatel, its customers and to their peers. Attitude is everything! Sure, we can teach skills, but it’s nearly impossible to teach and instill enthusiasm, teamwork and independence. 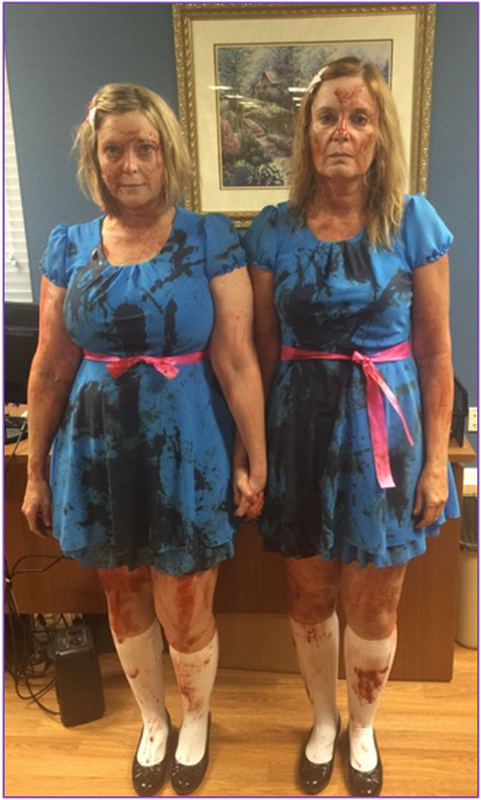 But, we have that here at Avatel with staff members like Emily and Rhonda. 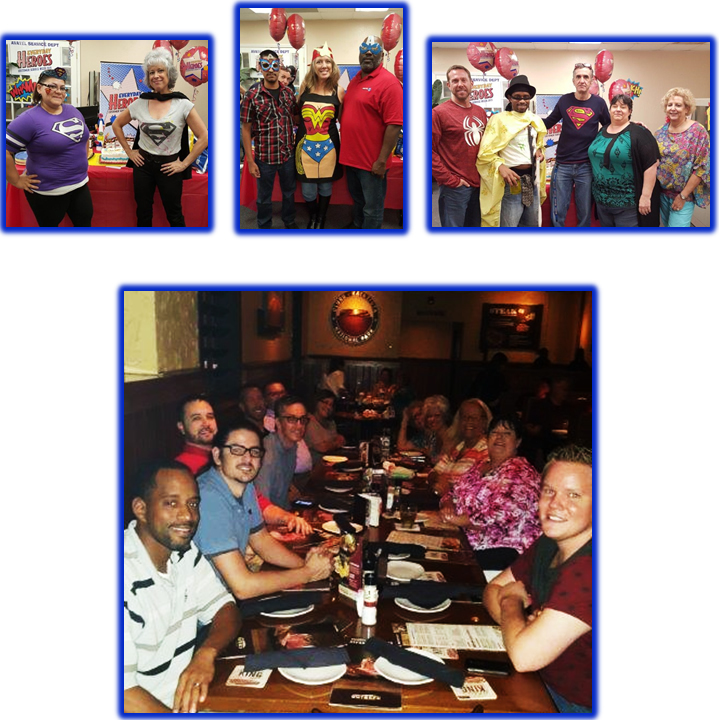 They are great employees because of their motivation for working on behalf of our customers and their co-workers. Thank you Emily and Rhonda, you guys are truly inspirational. Gratitude allows us the ability to see not just what we have, but to see the value in what we have. Gratitude encourages each of us to reach higher because we feel valued, respected and important. So, as we celebrate our success, I want to thank each of you for bringing your best to work every single day. We sincerely appreciate all your hard work, commitment and dedication. 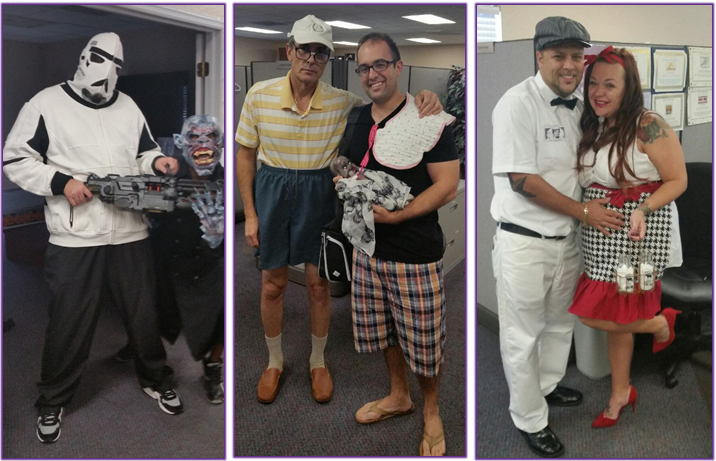 As always part of our Halloween activity is a costume contest. 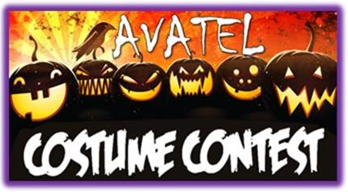 All Avatel team members voted on for their favorite costumes – scariest costume, funniest costume, and best overall costume. During the first full week in October we honor the people who serve and support our customers with the highest degree of care and professionalism. 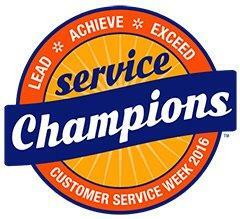 This year’s Customer Service Week theme was Service Champions. The theme recognizes that delivering excellent service is only possible with a team of dedicated professionals working together. It’s a powerful message that everyone celebrated during Customer Service Week 2016. 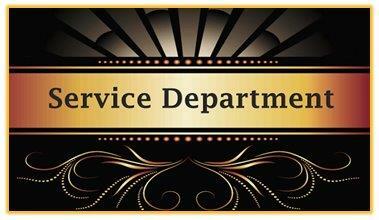 Service-oriented departments are the backbone of any successful business. As we celebrate our Service Champions, we shine a spotlight on their selfless and hard-working technical support and customer care excellence. We believe that it is important to recognize our Service Staff and express thanks and appreciation for what they do throughout the year but specifically during the first week of October. 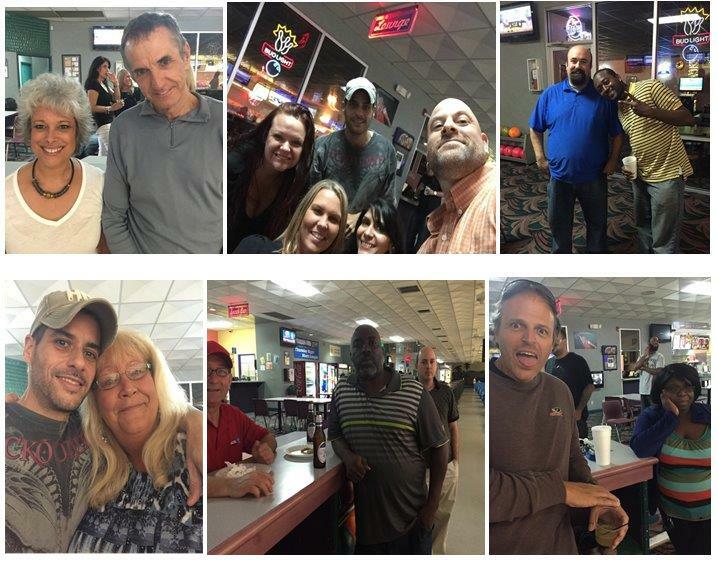 Our Fearless PM Champions – Johnann, Lonnie, Jennifer, Tom, Shawn, Yessie, Teryle, Angela, and their Leader Rick Heitzmann. Our invincible Engineering Champions – Garrett, Frank, Joseph, Jeff, Jon, our newest team member Chris Perez, and their leader Bruce Brewer. And of course, the unstoppable Jim Kelly. 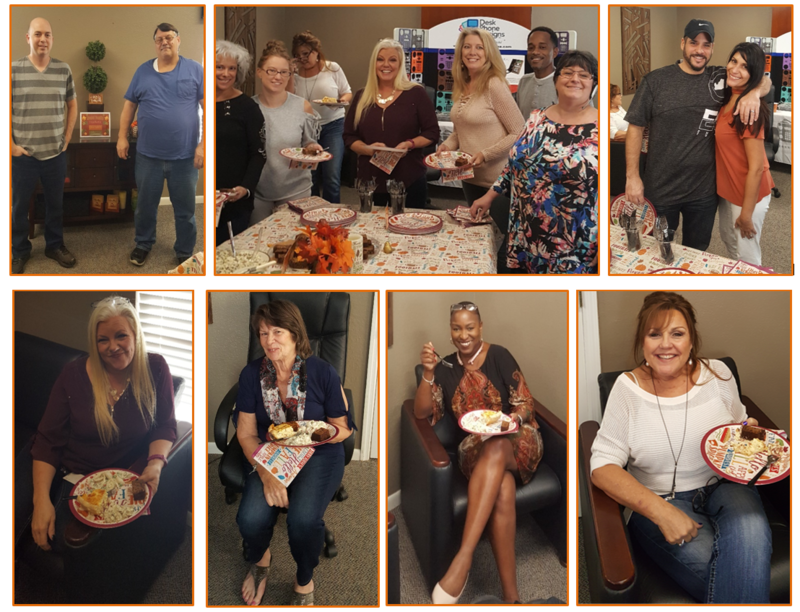 The week of celebration at Avatel was filled with a wide-range of activities that capture the spirit of Customer Service Week, focused on recognizing our Service Department for their hard work and commitment to service. 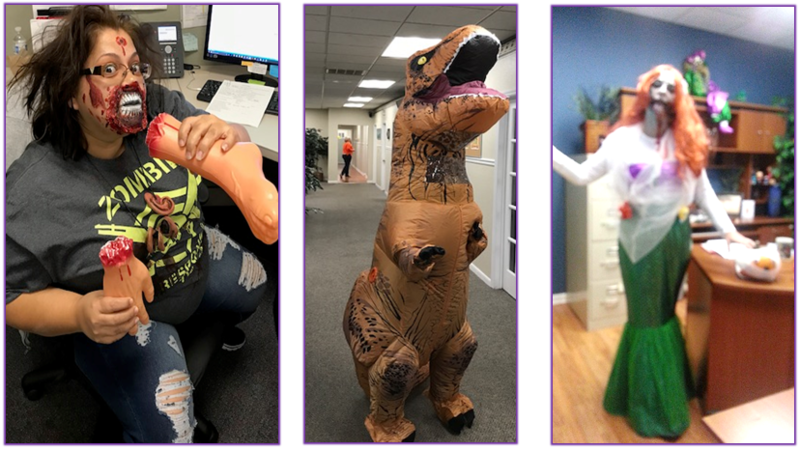 Avatel celebrated Customer Service Week in style by incorporating fun activities, tempting treats and special gifts that made it a week to remember for our Service Champions. On Monday, we kicked off the week with our Breakfast of Champions with team members dressed in comfy pajamas and cozy slippers. Special gifts were handed out to make the week memorable. Tuesday, all Champions need to De-stress – All Service team members received a chair massage to relieve stress and muscle tension – renewing energy levels, enhancing concentration and focus. Our Service Champions enjoyed some afternoon dessert as “Stressed Spelled Backwards Is Desserts”. 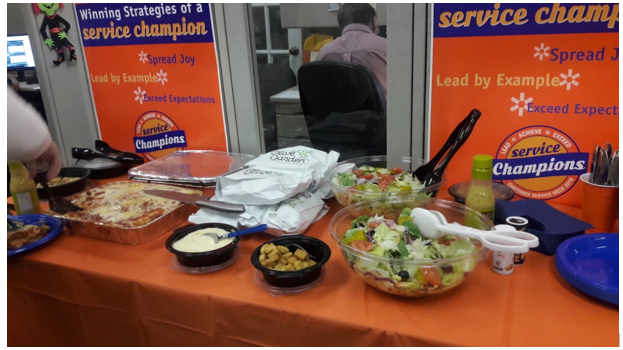 On Wed. we served a Service Champions thank you lunch catered by Olive Garden and presented to the service team members as an Italian Buffett. Special gifts were handed out to express our gratitude. Champion’s theme day was on Thursday – All Service team members were encouraged to come to work dressed as their favorite sports champions (sports jerseys, etc.). We also had to keep our Service Champions in tiptop shape, so surved sports drinks, energy bars, and other healthy snacks throughout the day. 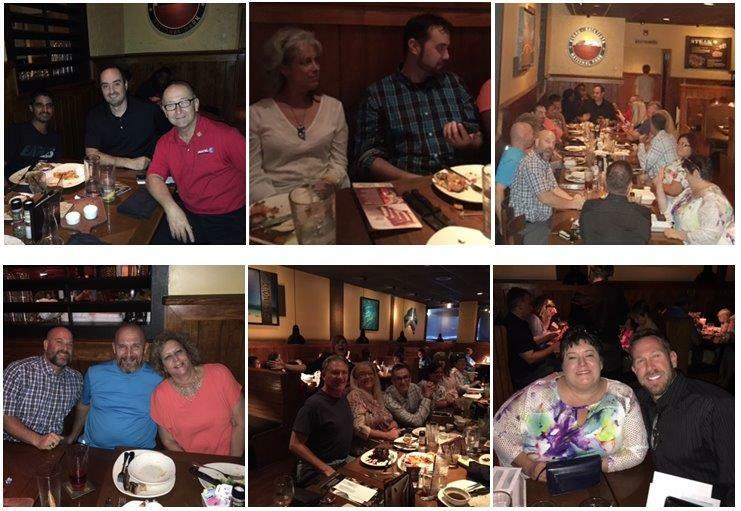 To close out the week, we honored our Service Team Champions at our recognition dinner at the Outback Steakhouse on Friday evening so Avatel could show our appreciation for all of their dedication and service excellence. Champions do so much more than win. Part attitude, part natural ability, and part hard work, living your life like a champion is possible in all walks of life. Our Avatel Service Champions identify the gifts that they’ve been given and seek to develop them into expertise. Every day, our frontline service professionals are Champions in their customer’s eyes and their co-workers that they support. Being a Champion is partly a list of achievements, but even more so a state of mind. Being a Champion has to do with knowing–really knowing–that you’re the best at what you do. We think it is vitally important to recognize people who provide positive experiences through the service they provide. 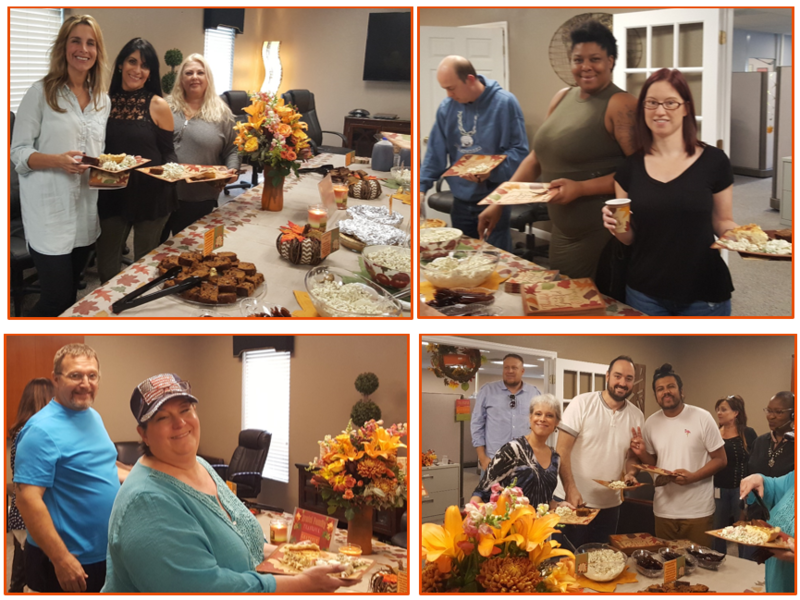 Customer Service Week gave us the perfect opportunity to show the Avatel Service Department that we appreciate their hard work and dedication, as we see them for the true Champions they are! 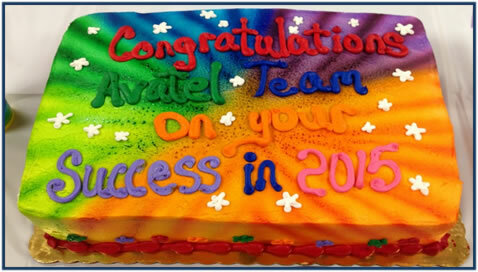 Every day Avatel Team Members drive the company forward. Our team’s motivation, commitment, and expertise have made Avatel the company it is today. I’m extremely proud of our Avatel team and the success in growing our business. We believe that when we focus on and celebrate success, we actually create more success. So, with that said it is time to recognize the accomplishments and contributions made during this 2nd Quarter of 2016. 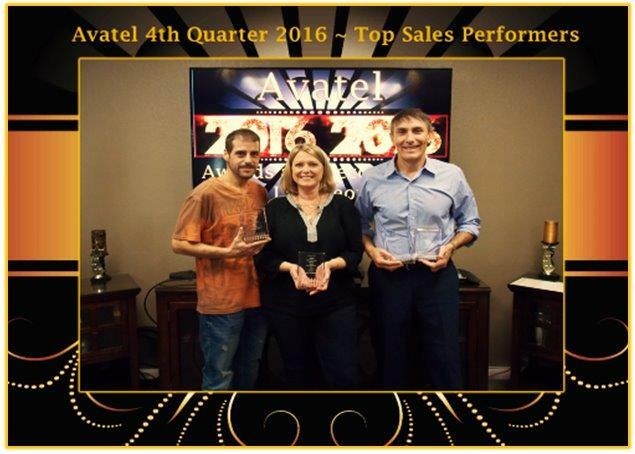 Every Avatel Sales team member should be proud of both individual and collective contributions to our sales effort. 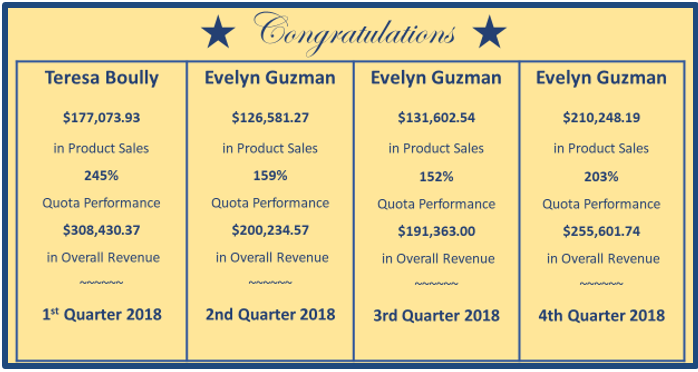 Congratulations on a Fantastic 2nd Quarter Sales Teams! Great support takes effort, dedication and commitment. Excellence is an attitude engrained in every Support Department Team Member. We sincerely thank our team members for the work they do to make Avatel great. Without their commitment and high standards, we would not be the thriving company we are. We are happy to announce the contributions to our 2nd Quarter results and the unbelievable efforts that our support departments provided. Engineering Team – Avatel Engineers are the technical experts that deliver our solutions with agility and speed. Their knowledge positions them as a resource with a proven track record of success; through customer and staff support, system configuration and customer demos to assisting techs in the field, and complex site implementations. We sincerely appreciate Our Avatel Engineers as they consistently demonstrate performance at a level far above and beyond normal expectations. 2nd Quarter Activity – 1,544 Completed Service Tasks, 141 Demo/Customer Presales calls/Tech calls and 75 New Product Configurations. Project Management Team – Avatel PM’s all stand out for above and beyond behaviour. They display excellent skills, strong support of co-workers, excellent customer service abilities, exhibits drive and enthusiasm and has an optimistic attitude. All of our PM’s are resilient and are determined to achieve their personal bests. I want to thank our Fantastic PM’s for your excellent execution and continued dedication. 2nd Quarter Activity – 1,168 solutions managed, 1,743 service tasks created and 19,096 Service calls handled with a 99.76% service level. Operations Team – We all understand how important Sales and Service is to Avatel; however, The Avatel Operations Department is necessary for Avatel’s day-to-day functioning and is the backbone of all our business processes. Our empowered operations team has a significant reach throughout the organization. Understanding and effectively managing the operations side of Avatel is key to our success. We appreciate our Operations group for driving flawless execution across all engagements. 2nd Quarter Activity – The Finance Group handled 26,324 finance transactions and Avatel HR handled over 271 employee support transactions. Avatel IT handled programed 34 CRM and Avatel Vault updates. The Avatel Purchasing team processed over 1,568 product orders and employee internal requests. 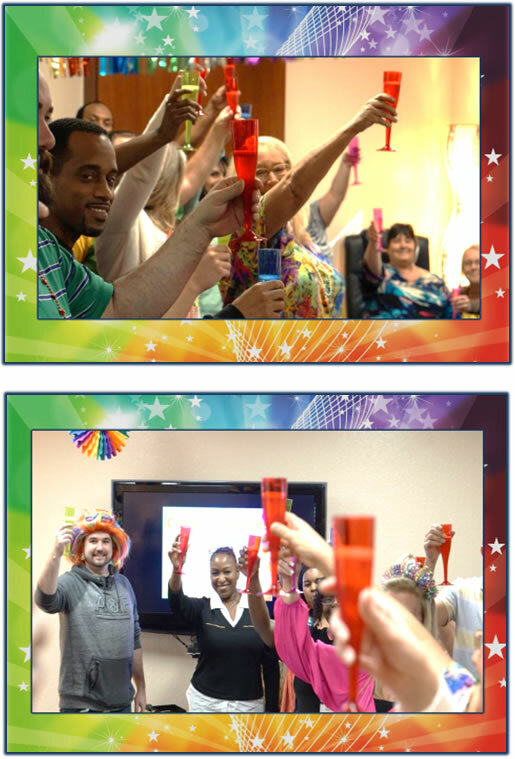 Congratulations on a VERY productive Quarter Support Departments! 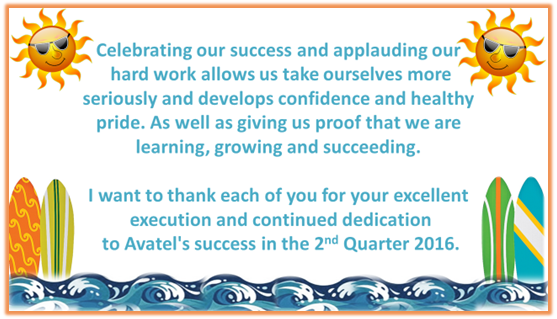 It’s time to celebrate all our Avatel team members and recognize the accomplishments and contributions made during this 1st Quarter of the year. The more we celebrate our achievements, the more there is to celebrate! In a culture of greatness we create a collective mind-set that expects great things to happen—even during challenging times. We expect our team members to be their best and we try to create a work environment that allows them to be their best. In a culture of greatness we don’t allow negativity to sabotage the moral, performance and success of our co-workers. We find countless ways to enhance communication, build trust and relationships that are the foundation upon which winning teams are built. While most organizations waste a lot of time putting out fires, we spend our time building a great sales organization that rises above the competition. 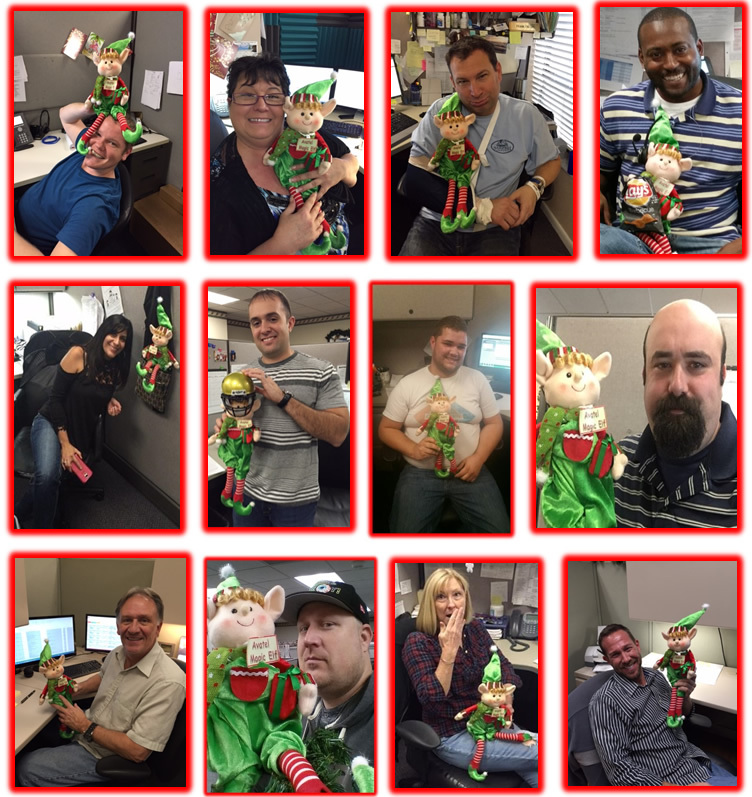 Congratulations on a “GREAT” 1st Quarter Sales Teams! Next we announced the contributions to our 1st Quarter results and the unbelievable efforts that our support departments provided. The support staff plays a very vital role in any business. 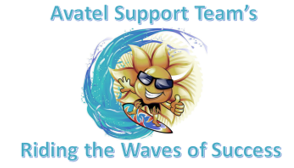 At Avatel we understand how crucial our support staff team members are for the productivity of all Avatel Associates. A Great support staff truly makes the difference between a mediocre company and an excellent company. Engineering Team – 1612 Completed Service Tasks, 80 Demo/Customer Presales calls/Tech calls and 89 New Product Configurations. Project Management Team – 1043 solutions managed, 89 internal activity requests, 1811 service tasks created and 14,230 Service calls handled with a 99.75% service level. Operations Team – The Finance Group handled 26,246 finance transactions and Avatel HR handled over 184 employee support transactions. Avatel IT handled programed 30 CRM and Avatel Vault updates. The Avatel Purchasing team processed over 1,483 product orders and employee internal requests. As we focus on what we want to accomplish in 2016, it’s also important to take the time to look back at past successes and to celebrate our accomplishments. In our culture, we are always looking ahead at where we want to be and what we want to achieve. However, it is equally important to take the time to celebrate and acknowledge our success. Focusing on our success creates a positive culture that leads to further success. The more we celebrate our achievements, the more there is to celebrate! as well as giving us proof that we are learning, growing and succeeding. At the beginning of 2015, we had to make a choice, either enable growth or inhibit it. Our choice was clear, if we were to achieve new heights and revenue marks in 2015, we had to shift our mindset from maintaining to growing and create a culture that embraced growth. Before we closed the book on another year, we take some time to review the results from our 2015 Growth Plan initiative. • We upgraded our technology infrastructure to sustain our growth initiatives. • We remodeled our building to accommodate our growth. • We hired a new team of successful sales associates. 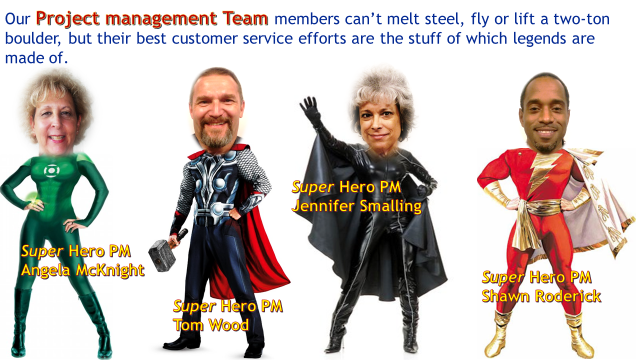 • We hired three new PM’s and one new Service Desk Associate – all performing above expectations. • We promoted four individuals – all stepping up to the plate and all going above and beyond in their positions. • We hired one new talented Engineer. • We also brought on a new Service Director at the end of the year. • Last but not least, we exceeded our 2015 financial goal. but helps us to see our own possibilities more clearly. 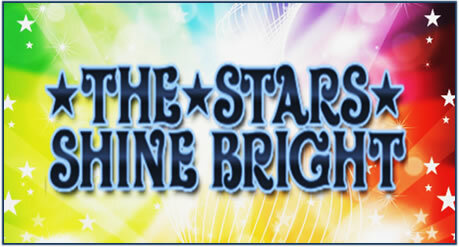 We have Rising Star’s, Shooting Star’s and Shinning Star’s, that deserve to sparkle! 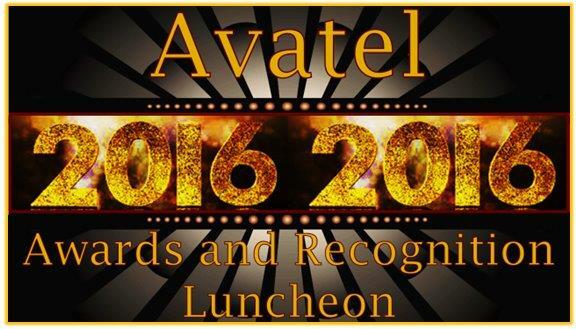 All our Avatel Star’s shine bright as we recognize their 2015 shimmering achievements! Sales is what drives Avatel’s growth. Adding sales personnel and improving our existing sales staff have been essential parts of growing our company. Let’s face it, nothing happens until something is sold. The Avatel Sales Staff aren’t just the people responsible for building our bottom line. They’re also our front-line troops, the ones with the most daily contact with our customers. With that said, we understood the importance to not only grow our sales force, but to grow it properly. 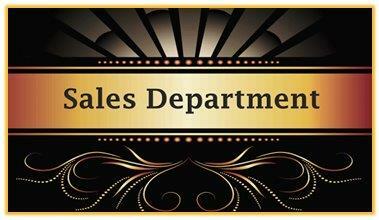 Sales Department Recognition – The Avatel Sales team (new and tenured) are an efficient revenue machine. They have a set of clear cut goals and targets which they are driven to achieve. Our action oriented sales group follows their plan, works to achieve their targets, and pursues success through hard work each and every day. The Avatel Sales Team has a winning edge strategy that pushes them to make one extra call, one last attempt, and one more task before calling it a day. Our mission is to be recognized as the standard of excellence in the telecommunications industry, through our dedication to knowledge, emphasis on teamwork and an eye towards addressing customer needs and delivering unsurpassed service. At Avatel, we strive to sustain a culture of service excellence, from system design and implementation to project management, customer training and ongoing service support.The Avatel Service Departments technical ability, has enabled us to be a leading player in our industry. Avatel Project Manager Recognition – Our PM’s have the experience, knowledge, and capabilities to help ensure a successful, transition of technology for our customers. Their key objective is to exceed our customer’s expectations and bring a higher set of quality and customer service standards to our industry. Avatel Engineer Recognition – Avatel’s Engineers make communications technology the best it can be. They are the technical experts that help deliver our solutions with agility and speed in order to help maintain our competitive edge. Our “Task Master’s” are confident in their abilities through unmatched technical expertise and depth. They have strong problem solving abilities and excellent communication skills. The Avatel Operations department is the department that handles all the day to day operations of the business and the glue that holds the organization together. They are responsible for driving operational excellence across the organization as they focus on People, Processes and Profitability. They consist of team members that support all of our business functions: HR, IT, Finance and Procurement. They work together to create the backbone of all our business processes. Finance Team- Money is the lifeblood of a business and finance is the nerve center. The Finance department is responsible for all the day to day transactional accounting for the business through accounts receivable and accounts payable. Human Resources Team – The Operations department is also responsible for Avatel’s HR functions such as payroll administration, securing, offering and explaining benefits, like health insurance or 401ks more. Purchasing and Procurement Team – The role of Avatel’s Purchasing team is to provide the right product, at the right price, at the right place and at the right time, to meet the needs of Avatel staff members and our customers. IT Team – The Avatel IT department enables our business users to carry out their roles efficiently, productively and securely. 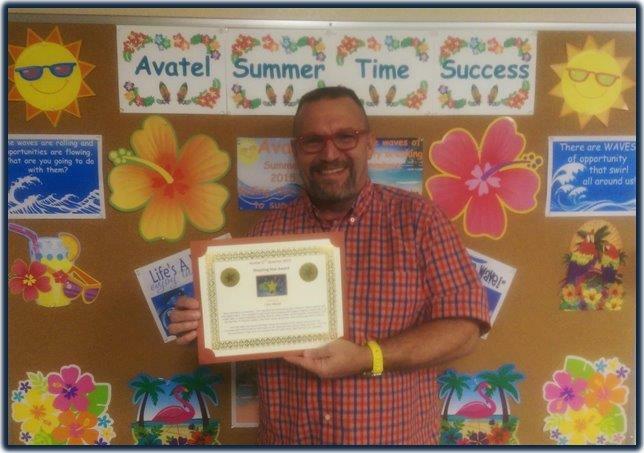 IT Shinning Star Recipient – Joe C.
Our year-end review allowed the whole Avatel family to come together and recognize everyone’s individual hard work as well as everyone’s collaborative works. We believe that it is really important to take a look back to see how far we’ve come. It not only put us in a positive mindset as we set goals for 2016, it created the positive momentum needed to achieve even higher goals in the year ahead. Every day that dawns, brings with it the opportunity for growth and improvement at Avatel. What doesn’t work, can be repaired. What does work, can be made better. What is good, can be made great. 2015 was a year of great success for Avatel. 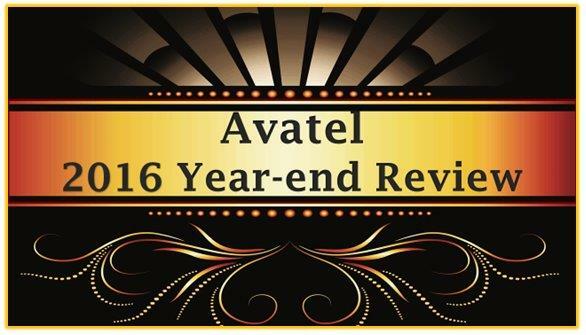 I want to thank all our Avatel family members for their contributions to Avatel’s success in 2015. 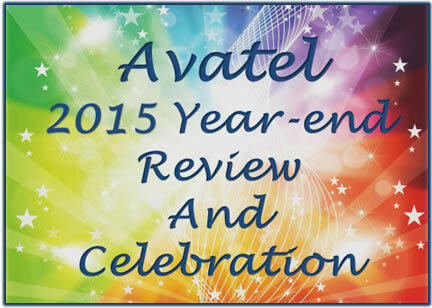 I want to thank each of you for your contributions to Avatel’s success in 2015. 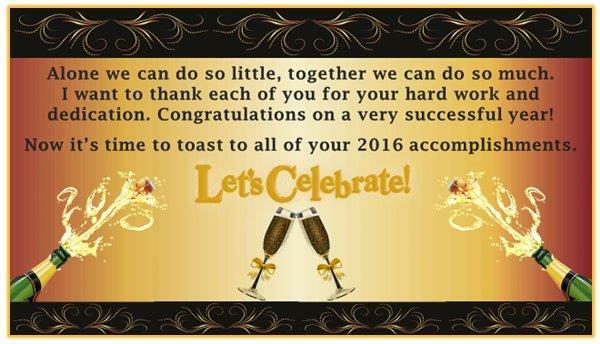 Now it’s time to toast to all of your 2015 accomplishments as you’ve earned it! Here’s to the Avatel team! Together we will make 2016 shine! 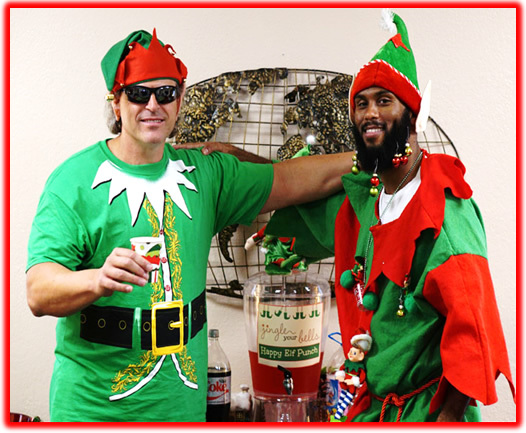 Just as last year, our Holiday theme for 2015 involved Christmas Elves. According to the legends, elves are magical, mischievous pranksters who make special appearances during the lead up to Christmas. 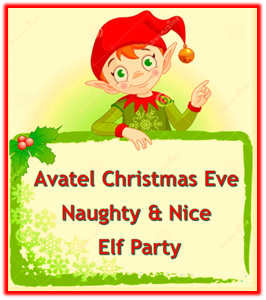 At Avatel, we have discovered that the Christmas Elves are adventurous! 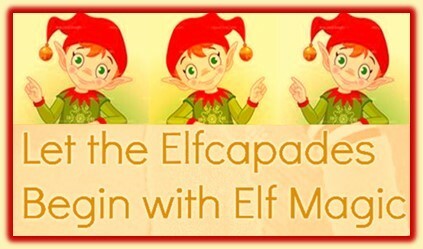 Their Elfcapades range from the sweet to the mischievous and have been known to get up to all sorts of pranks and mischief in the Avatel office. We never know where our Magic Elf will turn up! The good news is that when this magical creature made a visit to an Avatel workspace, he released performance enhancing magic in their direction. All they had to do is believe and the magic began to move in ways they could only imagine. Apparently, Elves love to be in pictures. 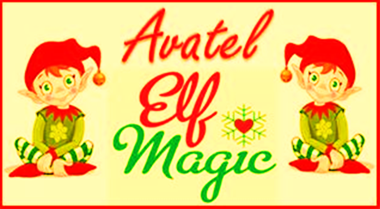 See all the Magic Elf selfies below with their new Avatel friends. Elf Magic is the Christmas spirit you can hold in your hand and feel in your heart! 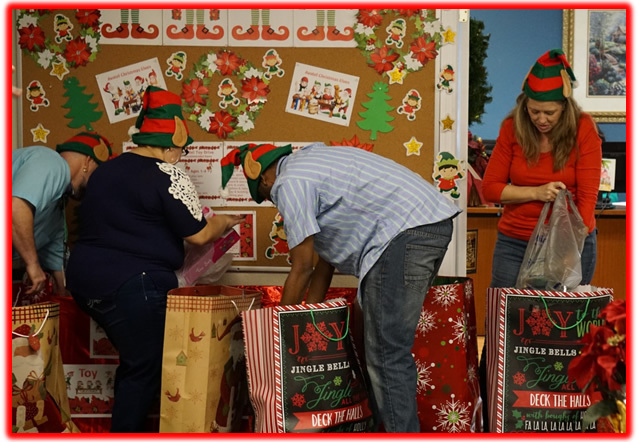 At Avatel, the Christmas elves spark the spirit of giving with our Avatel Christmas Toy Drive as we partner with Metropolitan Ministries to provide toys to boys and girls. 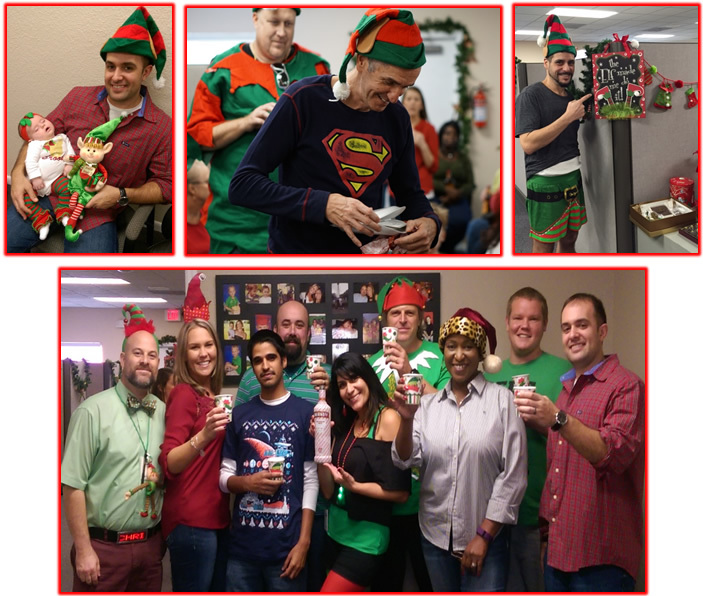 Avatel appreciates our Volunteer Elves – Andrew, Yesie, Eric and Teryle. 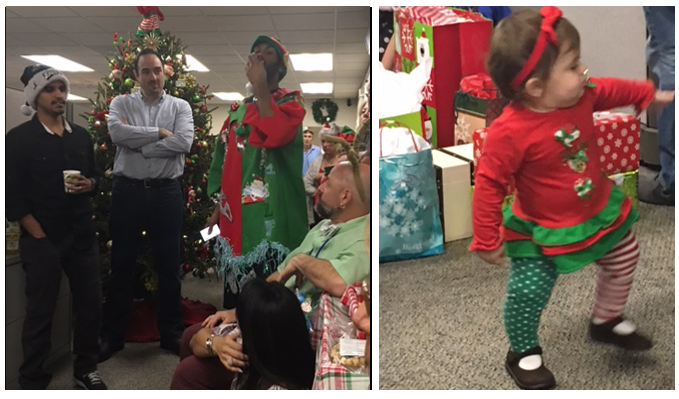 On Christmas Eve, we all joined together for great food, happy Elf punch, and our Naughty Elf gift exchange game. Of course, during our game, Elf Bribing, Elf haggling, and Elf pleading was part of the game. We were also blessed to have some of the Avatel children join the fun. Also, last year we held a contest for the most creative Elf attire, and the year before we did an Ugly Christmas sweater contest. 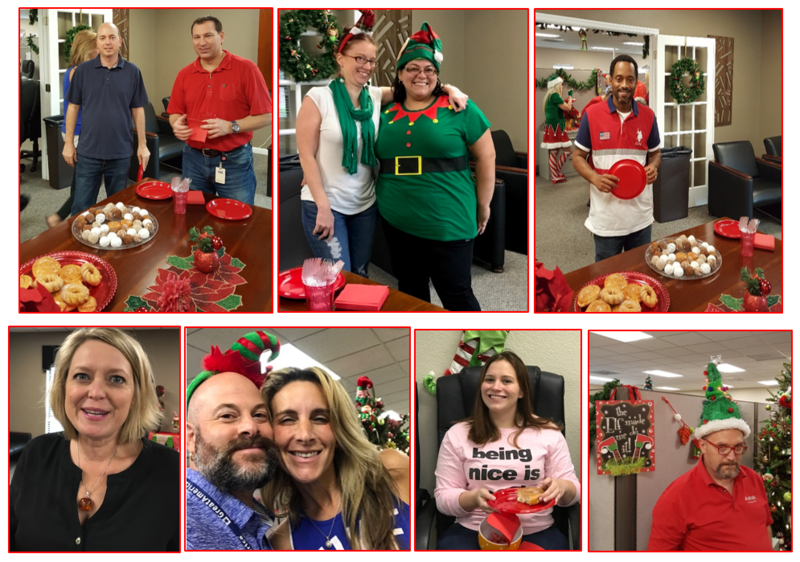 We added a twist this year and offered two prizes – One prize for the best Elf outfit attire and one prize for the most whimsical (outrageous) outfit (ugly Christmas sweater, crazy Santa, or anything funny and outrageous). Our winners Dan and Keon outdid themselves! 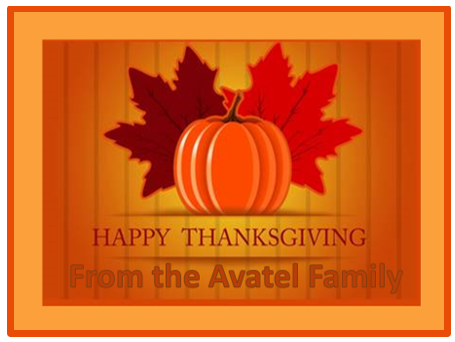 All Avatel family members hope your holidays were blessed. Now, since the holidays are over it’s time to get ready for the New Year! 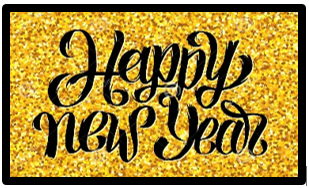 Here’s to a Happy and Healthy New Year!! November is not only about gratitude, it is also about giving. Giving brings virtues such as understanding, respect, compassion, gratitude, and humility together into a powerfully positive and enduring act. The spirit of giving is a sustaining force, enriching whatever endeavor or circumstance it touches. 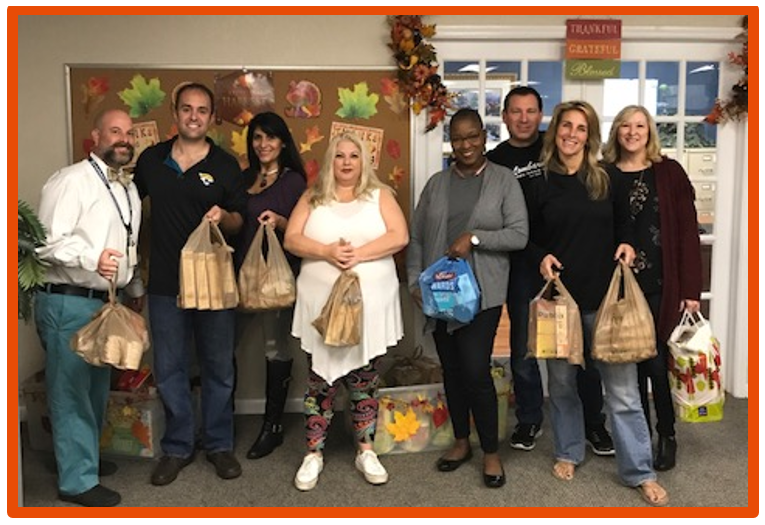 As part of Avatel’s Giving Back program, every year we team up with Metropolitan Ministries to provide holiday meals for struggling individuals and families in our community. Our food drive is a great way to give back and feed the hungry families in our community, as it gives them a sense of hope for the day and warmth in their tummies and hearts. Thanks to the generosity of our Avatel team members and Andrew and Teryle volunteering, our gifts of hope provided homeless and hurting families with warm meals on Thanksgiving. Harvest, by definition is the season for gathering. So, our Harvest Brunch was a great time to gather together and interact with each other. We believe that every day is rich with opportunities for each one of us to make a positive difference in the lives of those around us. October 2015 Updates Our theme for the month of October was ~ “Let’s Make Some Magic Happen”. The world is a magical place. Just because you have grown accustomed to the magic does not make it any less so. The real magic of life is not a trick or a supernatural phenomenon, it is in the fact that you can see, feel, think, choose, live and love. At Avatel, we believe that every day is our opportunity to perform magic in this life and in this world. If the day is dreary, we can brighten it with our words and our actions. We understand that our days can be filled with magic only if we make it so. Our Avatel team members use every opportunity to fill each moment with the real and priceless magic of being fully and positively engaged in life. At Avatel, we experience the magic and the joy of simply being around the people who make us feel that anything is possible in this world. We started our 3rd Quarter review with the exciting news that we broke our all-time record with our sales results for the Quarter. Next we announced the contributions to our 3rd Quarter results and the unbelievable efforts that our support departments provided. We had record breaking activity in all support groups. Engineering Team – 1644 Completed Service Tasks, 126 Demo/Customer Presales calls/Tech calls and 83 New Product Configurations. Project Management Team – 1365 solutions managed, 123 internal activity requests, 1643 service tasks created and 5148 Service calls handled with a 99.73% service level. Operations Team – The Finance Group handled 23,540 finance transactions, HR handled over 300 employee support transactions, and IT handled programed 26 CRM programming updates and developed a new Avatel proprietary remote desktop access tool and our Purchasing team processed over 1700 product orders and employee internal requests. Bruce Brewer – You’ve lifted us to new heights. You’ve surpassed expectations and reached for the stars. You motivate others to perform at their best, leading your Team toward ultimate success. Thank you for your remarkable performance. Jim Kelly – Your outstanding dedication and leadership have been truly appreciated by the entire organization. Your attitude, outlook and commitment inspire us onward and upward. Thank you for always leading the way. Kevin Woodford – Sales Associate in the Sales Dept. Joey Martinez – Purchasing Manager in the Operations Dept. Lonnie Ledford – Senior Project Manager in the Service Dept. 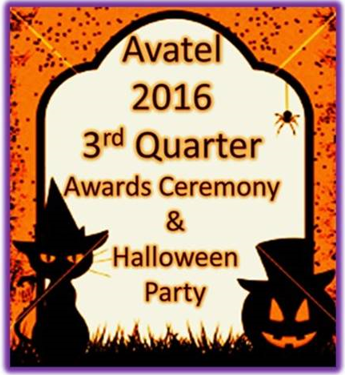 A Halloween celebration at Avatel would not be complete without good food, good drinks (including a little Witches Brew) and the opportunity for Avatel family members to wear costumes. Customer service is not just a department, it’s an attitude. Whether our service team members are interacting with customers or with co-workers, rewarding their willingness to serve others is our top priority. 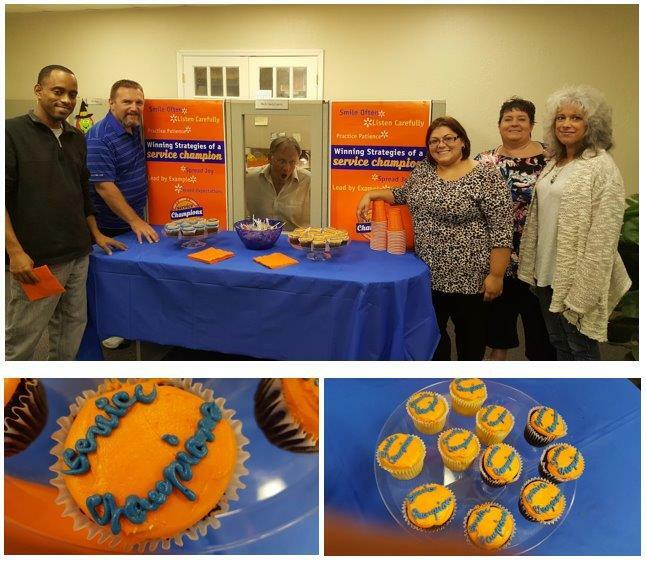 With that said, Avatel was proud to celebrate Customer Service Week 2015, October 5th – October 9th. We believe that it is important to recognize our Service Staff and express thanks and appreciation for what they do throughout the year but specifically during the first week of October. 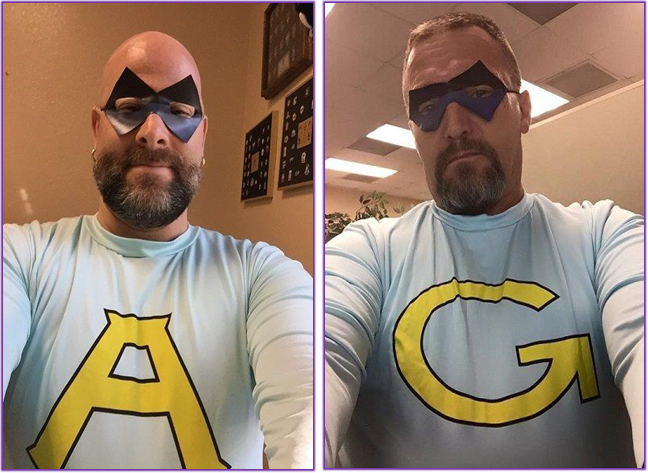 This year’s CSW theme was Everyday Heroes. The theme recognized that every day, frontline service professionals are heroes in their customer’s eyes and their co-workers that they support. 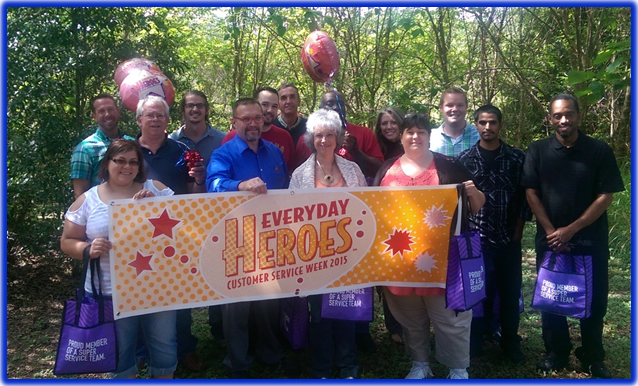 Avatel, along with other companies across the country came together to recognize the everyday heroes in our midst: our selfless and hard-working technical support and customer service teams. This was our 5th year participating with other service professionals world-wide as we celebrated our Service team member’s achievements. Service-oriented departments are the backbone of any successful business, and there wasn’t a better time to shine the spotlight on our dedicated teams! CSW is our greatest opportunity to show the service department staff that we appreciate their hard work and dedication!!! As their customer service and great attitude shines bright for all to see! 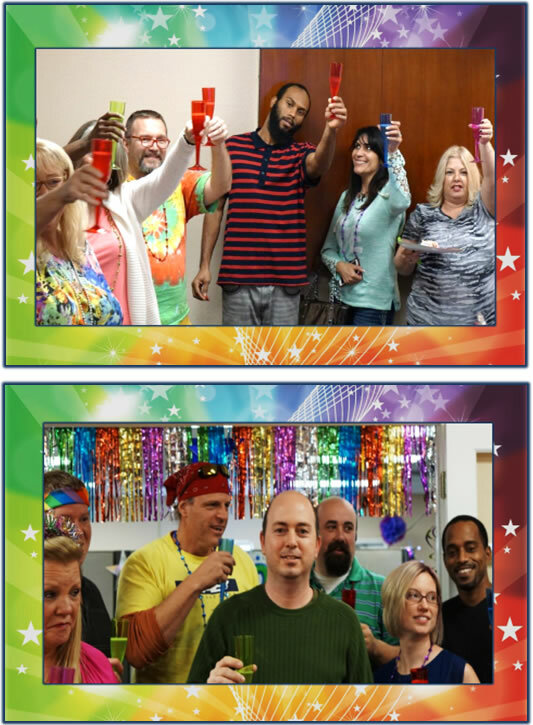 The week of celebration at Avatel was filled with a wide-range of activities that capture the spirit of CSW, focused on recognizing our Service Department for their hard work and commitment to service. Avatel celebrated CSW in style by incorporating fun activities, tempting treats and special gifts that made it a week to remember. 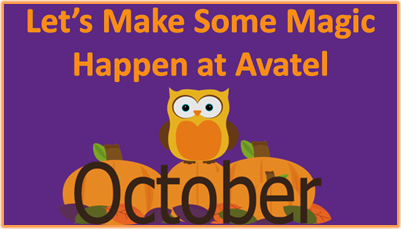 For the month of September, we put a challenge to the Avatel Sales Associates. We challenged the team members to achieve a six figure sales month. 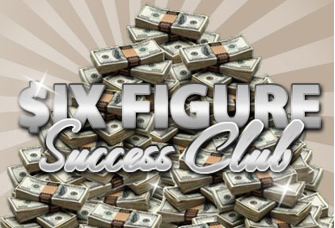 We called the challenge “The Six Figure Success Club”. 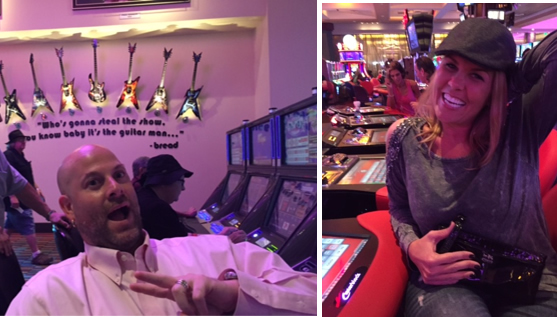 The reward for meeting and or exceeding the challenge was an afternoon at the Hard Rock Café including lunch, drinks and a little gambling fun. The winners had a GREAT time, as you can see! Finding the motivation to stay focused, work hard and believe in your dreams requires mental strength, fortitude and dedication. It’s one thing to have a dream; it’s another to set goals and to work hard year after year, month after month, day after day to achieve it. By celebrating our achievements, we not only acknowledge a winning result but also reinforce the attitudes and behaviours that contributed to the successful outcome. When we get excited, rejoice, celebrate and feel genuinely happy for someone else’s success and good fortune, we are moving this energy and information forward into the Universe. We must remember that one determined person can make a significant difference, and that a small group of determined people can change the course of history. Everyone wants to be recognized and appreciated for doing a great job. Receiving recognition for achievements is one of the most fundamental human needs. I want to take this opportunity to thank All Avatel team members for your excellent execution and continued dedication. Emily has been going above and beyond the minute she took her first step at Avatel. When Emily is given a task she not only completes it with accuracy but always on time and stays on task. Dedicated, tenacious and organized are words that easily describe Emily. She champions the issues and helps each AE work through them in a timely fashion. Emily is truly an asset to Avatel. She is more than we could have ever asked for. Emily ALWAYS goes above and beyond for Avatel. Thank you for being such a shining star and always giving your best. We are so very happy you are part of our family. Since joining Avatel in February, Tom has done an outstanding job in Service. When Andrew Cohen was promoted to a Sales Management role, Tom stepped in and took over managing the Avaya Legacy Program, which was no small task. It means keeping/tracking data on every install, which requires coordination with all the PMs. It involves weekly calls with Avaya, going over and refining the entire process. Tom has been the liaison between Avaya and Avatel on the install process and has communicated effectively to both sides as we improved the process along the way. Tom has demonstrated a high level of customer service skills when dealing with our customers. 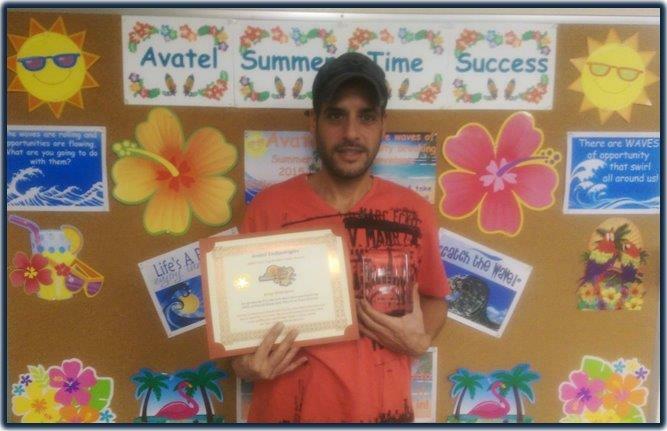 In the short time Shawn has been here, he has been an outstanding asset to Avatel. Shawn quickly grasped our processes and almost immediately maintained a workload on par with our tenured PMs. In addition, Shawn has demonstrated outstanding customer service skills and how to effectively work through issues with our customers and with the Avaya TSMs and Technicians. At Avatel, we’re committed to building a winning company. While we are very serious about winning, we try not to take ourselves too seriously. 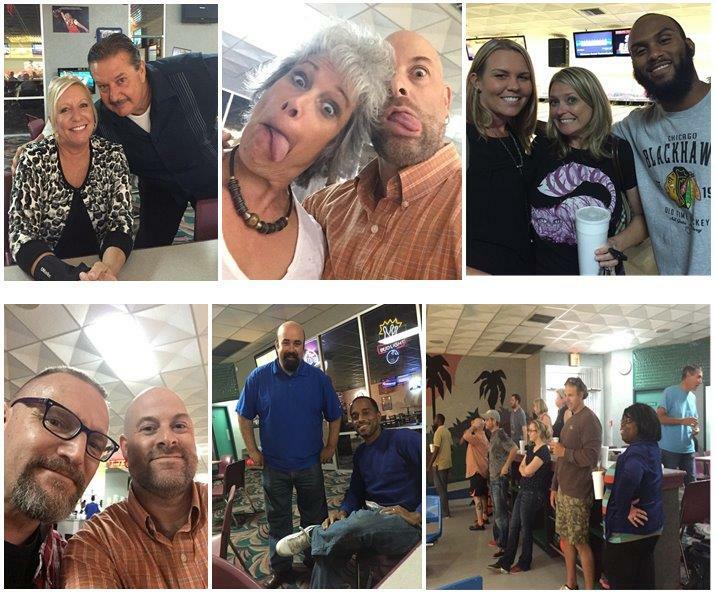 A winning workplace culture must also be a fun environment. 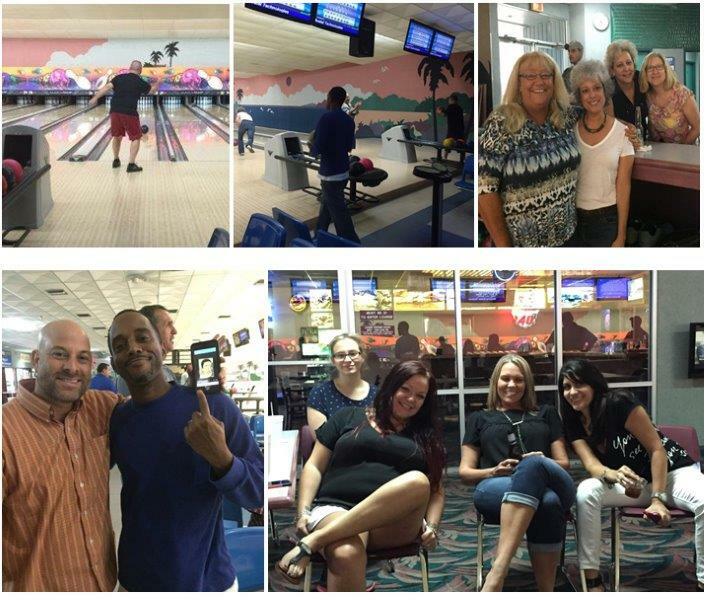 Fun is a big element of our culture at Avatel. So, let’s go bowling! We have fun together and we work hard together, which creates a team spirit of working together as one. Avatel has a unique winning culture that is supported by extraordinary team spirit and having a good time. Companies like Avatel, rise above the noise and get noticed! The reason for Spirit Week is to promote a positive morale and create a work atmosphere of team spirit. I believe that group spirit bonds people together. Companies that foster team member’s interaction are in a better position to be successful and a workplace infused with team spirit is one that is energized, innovative and motivated. 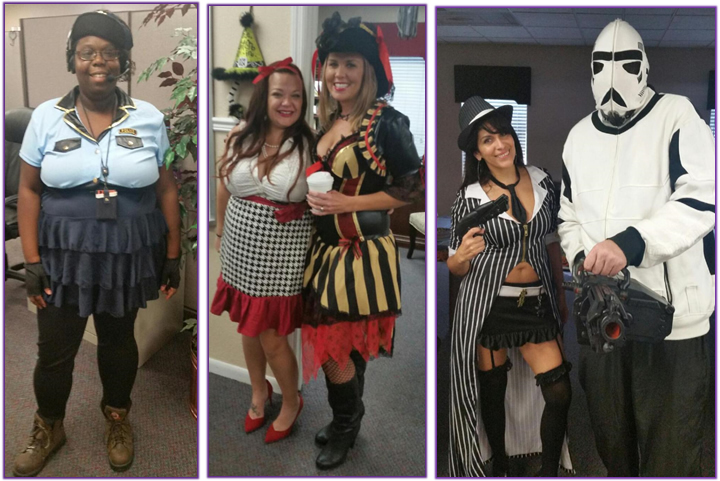 Avatel’s Spirit Week is meant to stimulate social activity, which contributes to higher camaraderie. Team members are eager to come to work because it is a place where they can thrive professionally and enjoy the company of co-workers. Contrary to popular belief, play and work are not mutually exclusive! I believe that a playful workplace relieves stress, increases motivation, and builds relationships with coworkers. When companies promote play, it engenders a more lighthearted atmosphere. When companies lighten up and create a fun workplace, there is a significant increase in the level of employee trust, creativity and communication. 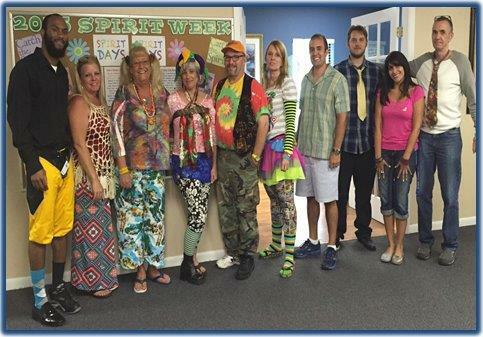 After a well-deserved long Memorial Day week-end, we began our week with “Crazy Mismatch Day”. We came to work on Tuesday with crazy hair, freaky mismatched clothes, strange mismatched socks and shoes, and clashing patterns. On Wednesday, we went back in time to the Disco era. Oh my! Our Disco queens and kings from the ’70s put on their sequins and bright colors, min dresses, bell bottoms, flashy jewelry, and whatever else looks good on the dance floor. 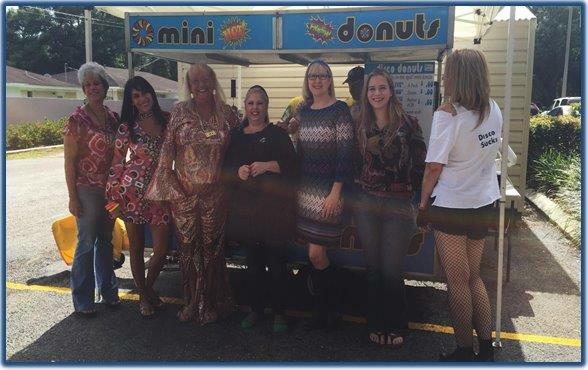 We also brought the DISCO DONUTS mobile mini-donut cart to our office that served hot, fresh mini-donuts while playing Disco music on our patio area. On Thursday, we celebrated Spirit Week in our pajamas. We called it “Pillow Talk Thursday”. 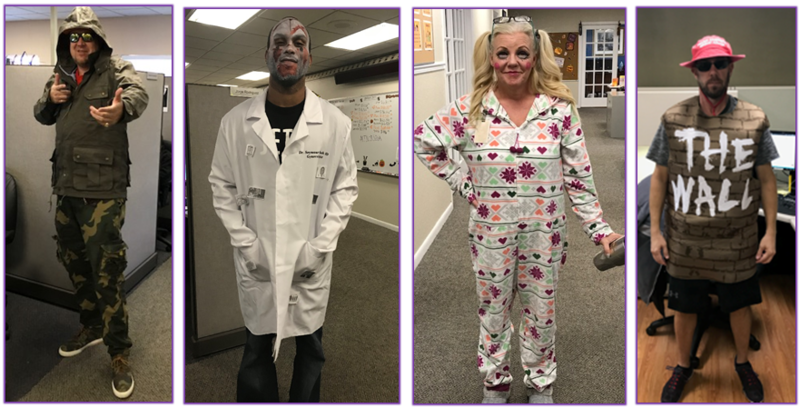 We Just got out of bed and came to work as we were!- Pajama Day is the ultimate comfiness at Avatel. We wore our festive pajama bottoms, flannels, footie pajamas and fluffy slippers, along with enjoying each other’s company as we feasted at the breakfast buffet. We all came to work dressed in our favorite beach attire, shorts and Hawaiian shirts, beach dresses, flip flops and straw hats. We enjoyed the Avatel Happy Hour from 4:30 – 6:00 on the patio. 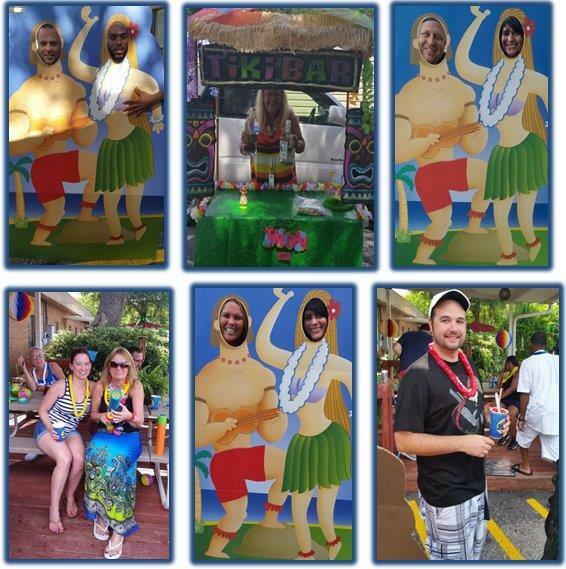 The Kona Ice truck served up our choice of tropical shaved ice drinks, along with our adult beverage Tiki bar. 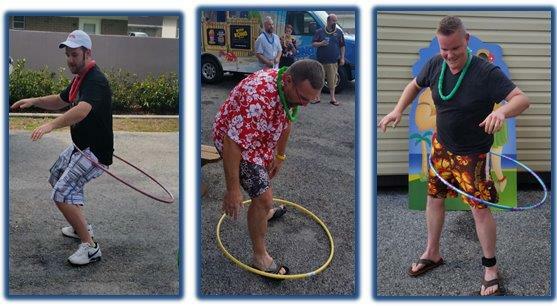 Avatel team members had lots of fun with the water guns and our hula hoop contest. 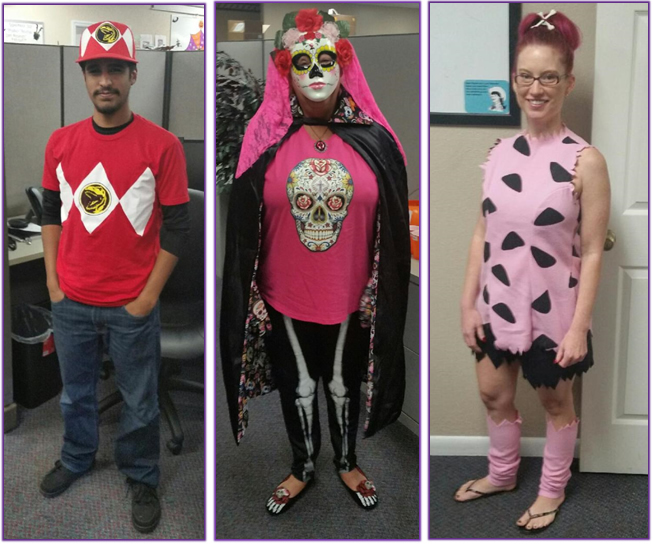 We had several team members that stood out during Spirit Week that showed great team spirit and a willingness to let loose and have some fun. Annette Duarte and Jennifer Smalling were chosen as the individuals that displayed what Spirit Week is all about. 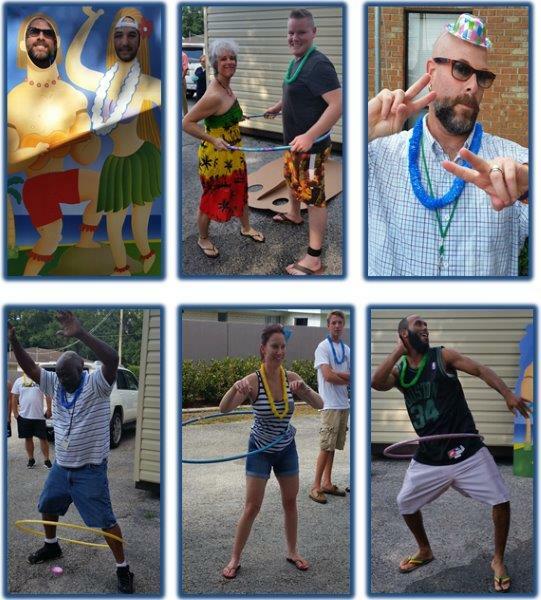 And, let’s not forget our Hula Hoop contest. Brandye Byers was hands down the best of the best! At Avatel, we believe that a fun work environment is one in which formal and informal activities occur regularly that are designed to uplift people’s spirits and remind people of their value to our organization, and to each other. 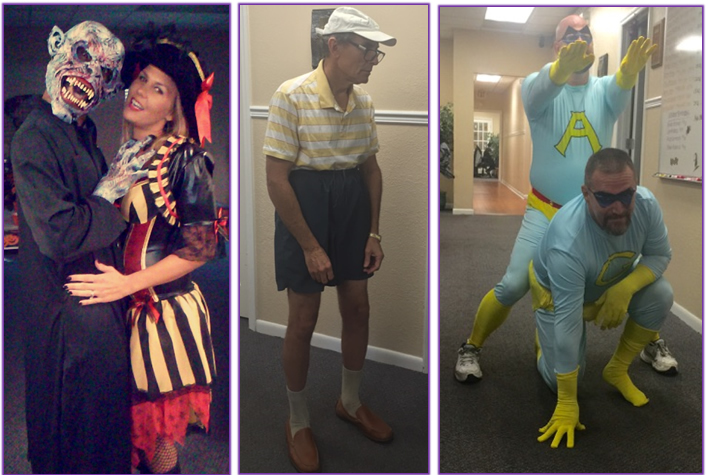 Avatel Family, Thanks for the great Spirit Week 2015 memories! !